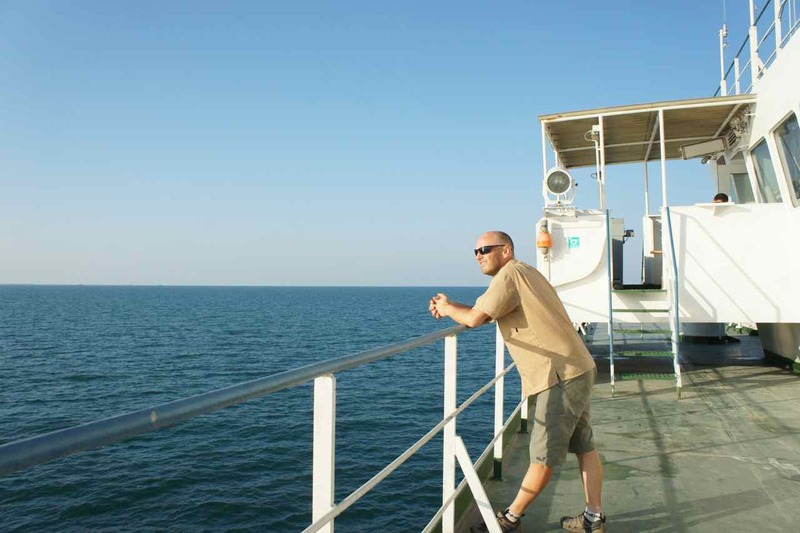 The unreliable sailing times of the ferry from Baku to Aktau in Kazakstan led us to book our beds at the hostel for one night at the time. This would sooner or later lead to problems since new guests kept coming all the time. We don’t know if it was to get rid of us or if it was of pure concern, but the lady who runs the hostel kept calling the ferry company several times each day to check if there would be any ferry. On Thursday morning she said it might be one on Friday, but when Friday came it turned out that there wasn’t going to be any departure that day. We asked if we could stay one more night at the hostel and although a bit problematic, the owner managed to let us stay by squeezing in some newcomers in her own apartment. With all our visas ready we spent a few hours visiting the Swedish honorary consul in Baku who is a friend of a friend back home. It was great to sit down and talk in Swedish to someone else but ourselves. The consul invited us for a midsummer night dinner the following day. During our stay in Baku I have serviced our bikes and Wej’s back tyre isn’t in the best condition so I moved it to the front wheel instead where it will wear out more slowly. 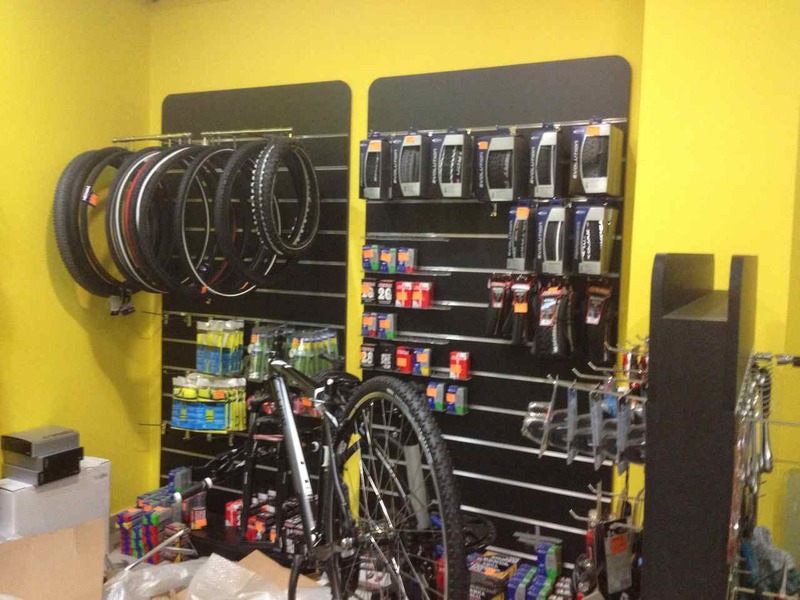 We can’t count on finding any good bike stores in central asia so our plan was to buy a spare tyre in Baku to carry just in case of the unlikely event that some of our tyres blow up, are cut by sharp rocks or simply worn out. Since Wej’s tyre was in a worse condition than we had expected we went to a bike store to buy not only a spare tyre, but also a completely new tyre for Wej. At the bike shop we met Magsud who has a summer job in the store and is a serious MTB rider. Magsud speaks very good English and we got his phone number in case we needed any help. When the Friday evening came we were still waiting at the hostel but on Saturday morning the hostel owner told us there would be a ship later that day. She also had a new group of visitors coming in so she almost chased us away. We were really confused because the hostel owner seemed to have a good contact at the ferry terminal, but her English wasn’t good enough to pass the details in the information on to us. We sent a message to Magsud who dropped by on his way to work and he translated all the information so that we could make a fact based decision. The information we got was that the ferry would indeed leave that day (Saturday) and she had reserved tickets for us and that we should be at the port at 8 PM on Satuday evening. The hostel was by now soon full of new guests and we all packed our bikes and cycled to a nearby park where we decided to have a common picnic lunch and then spend the afternoon by just hanging around. There will be a big army parade on June 26th and the Bulevar street (beach road) and the road leading into the port was closed for rehearsals. Earlier during the day someone in the group had tried to ride to the ferry terminal to check the status but had been turned away by soldiers. When it was time to leave for the port we were afraid that the army would turn us away so we called Magsud who once again came by and rode with us to the terminal. He did an excellent job in telling the soldiers that they had to let us through and when we rode by all the army vehicles parked for the coming parade it felt like an invasion was under preparation. There were hundreds of tanks, rocket launchers and troop transport vehicles parked in straight lines. 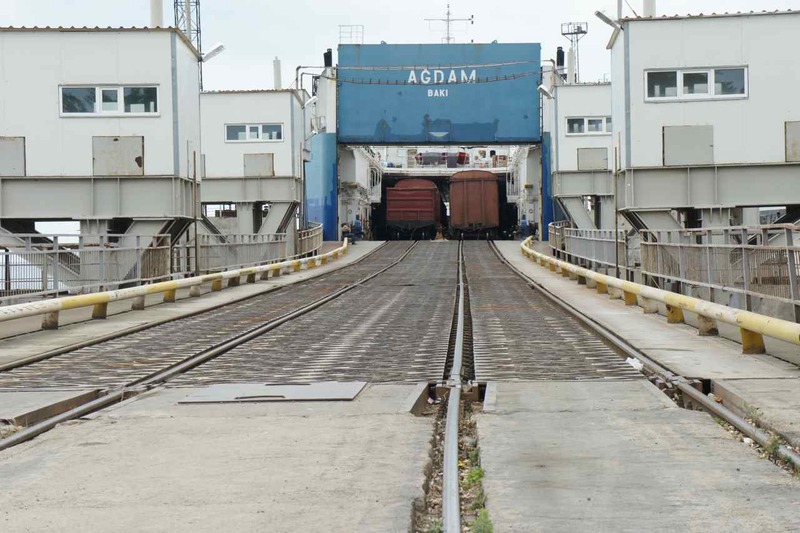 Once we arrived at the port around 7 PM on Satuday we found there was nothing. The ticket office was empty and the ferry was not in port. A group of German motorcyclists were already waiting there and they told us (one of them spoke excellent russian) that the lady who sells the ticket would come at 10 PM and that we would be able to board at midnight. 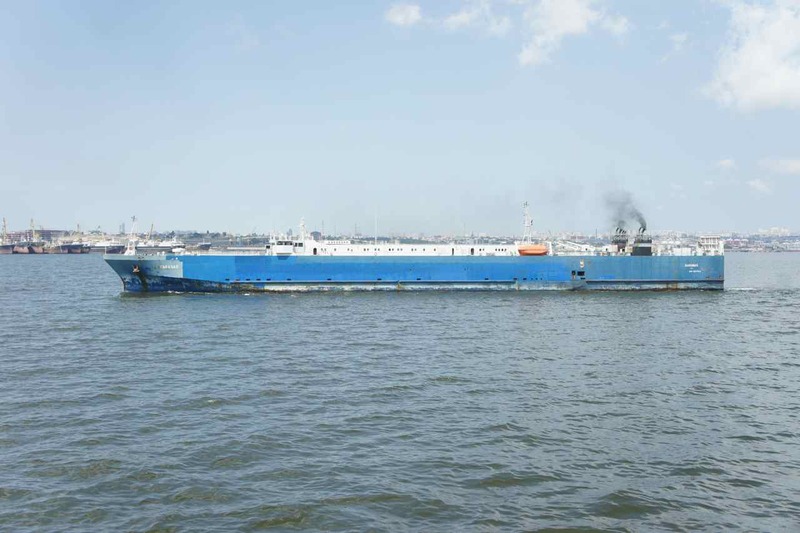 The ferry between Baku and Aqtau is not a regular passanger ferry, but a ship that transports train carriages across the Caspian Sea. It sails when there is enough cargo and when the weather conditions permit. We all got very excited when the ferry finally arrived in the Saturday evening but there lady in the ticket office was still absent. We spent our time waiting in an old shed and we had two 2.5 liter bottles of beer to share so the time passed easily 😉 Around midnight we learned that the lady selling tickets would come early in the morning instead. Rumours said that we could board the ferry before and pay straight to the captain afterwards, but we decided to spend the night at the shed. 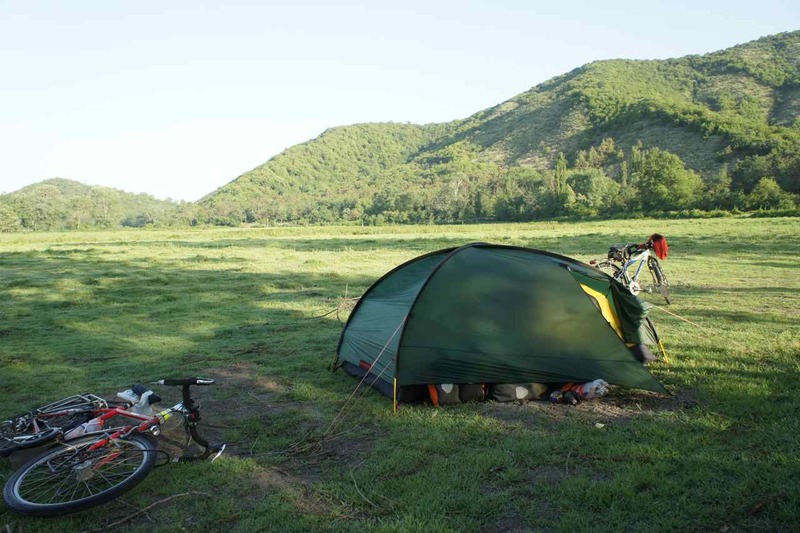 7 cyclists, 5 motorcyclists and a lone french backpacker spread out their sleeping matresses on the ground and fell asleep only bothered by mosquitos and the squeeking sound of railway cars being pushed on and off the nearby ferry. We woke up around 6.30 on Sunday morning and packed our equipment and had some bread with jam for breakfast. At 8.30 we went to the ticket office to buy our tickets. 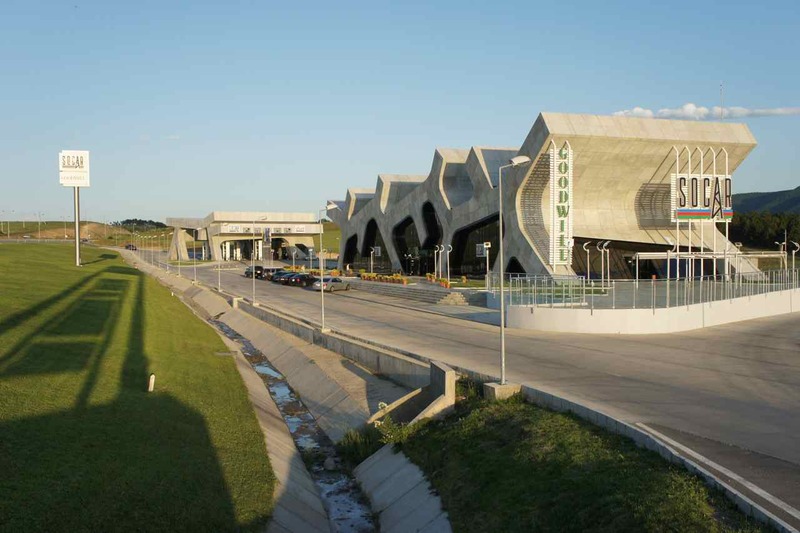 Finding the port and the ticket office and then buying the ticket is rather complicated and I have read numerous journals on the web about travelers running into all sorts of problems and that the lady selling the tickets is a witch. For us it was very smooth. The german motorcycle rider who spoke fluent russian helped us and the lady at the ticket office is certainly not a witch. She was actually very nice and smiled and joked all the time. 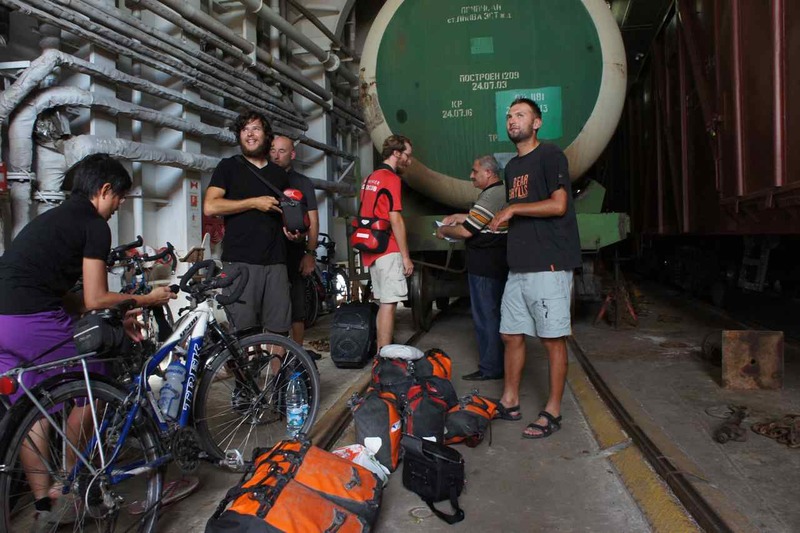 With tickets in our hands and our bikes loaded we were ready to board the ferry, but again nothing happened. We spent a few more hours waiting at the shed that now started to feel like our home. Sometime around noon on Sunday we were waved to the customs and immigration booth. Once again nothing happened and we had to wait another hour before being called inside to get our travel documents checked. 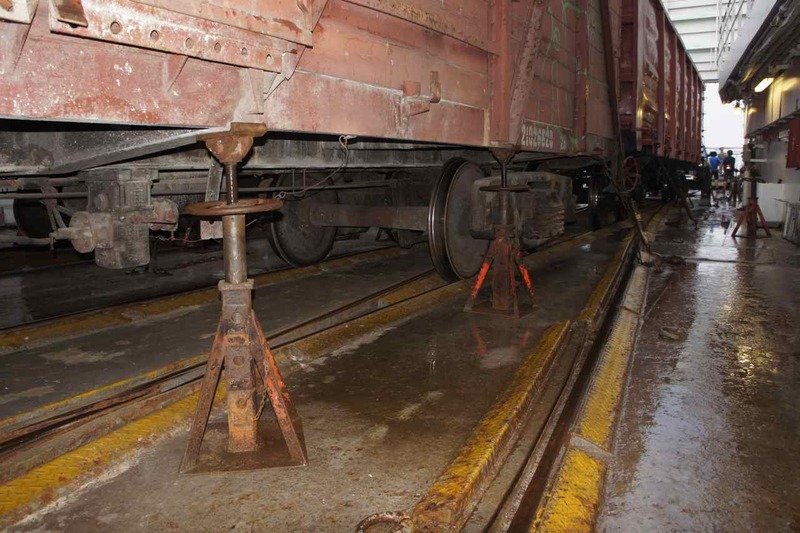 At 2 PM on Sunday we could finally roll over the gangway and park our bikes among the railway cars. The ferry only takes 12 passengers and we were 15 in total which caused some problems. We were told to wait in the passenger’s mess and we all quickly fell asleep. Being onboad the ferry didn’t mean that we were getting any closer to Kazakstan though. 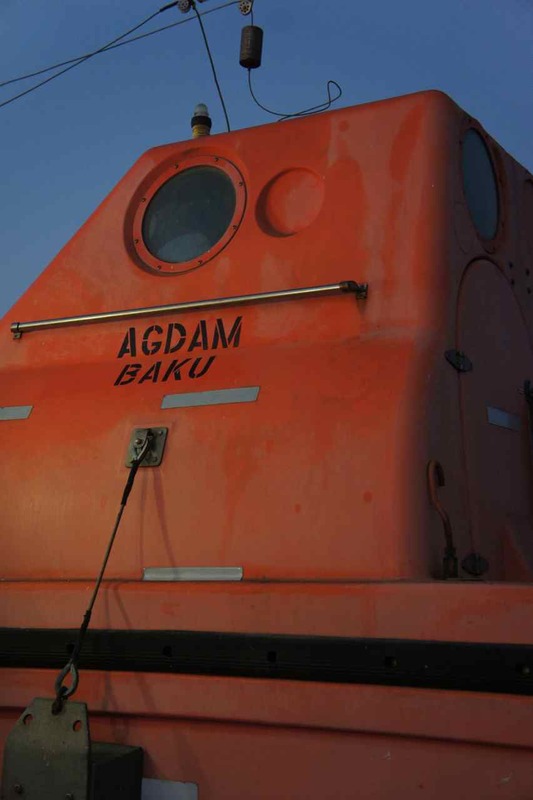 It took another 3 hours before the ship finally set sail and left the Baku’s port at about 5 PM on Sunday afternoon. We spent the good part of the Saturday day sitting and waiting in the park and then 22 hours by waiting at the shed and in the ferry before we really departed Baku. The ferry company has two ships on this route, one old and one that is newly built. 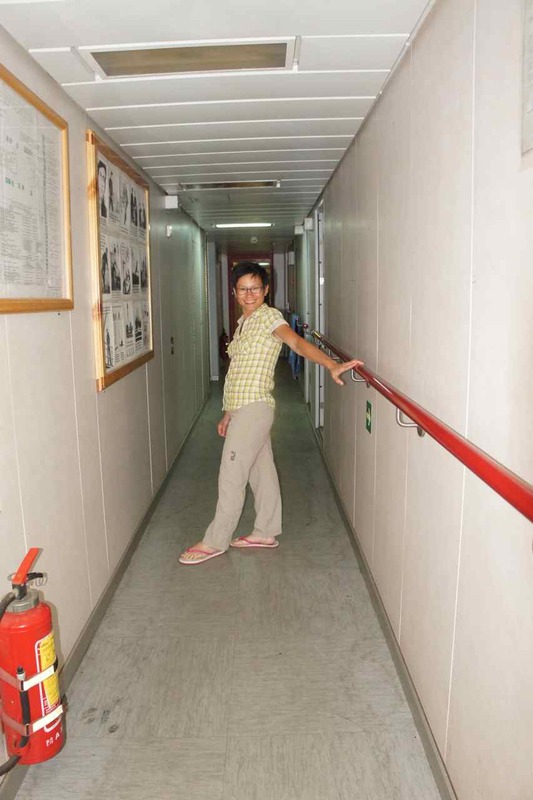 We are on the old ship (Agdan) and we are surprised that the ship isn’t in as bad condition as we had expected. The only drawback is that there has been a misunderstanding about our reservation and there wasn’t beds for all of us (bunk beds). 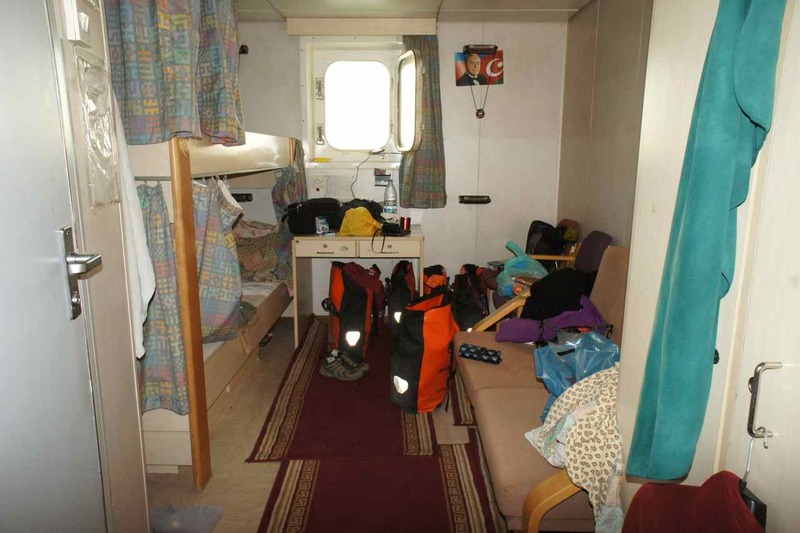 A crew mate was ordered by the captain to give up his cabin for Wej and me and our friends slept on their own matresses in the passenger’s mess. 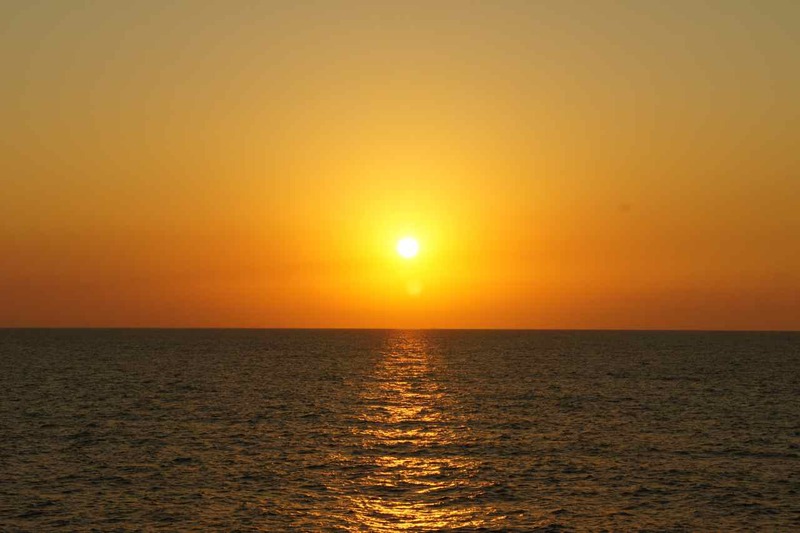 The main income for Azerbaijan comes from oil export and after leaving the port in Baku we sailed passed hundreds of oilrigs before we enjoyed a lovely sunset at sea followed by a bright fullmoon. We felt just like we were on a cruise and the only thing we lacked was some entertainment onboard but I guess the crew isn’t prepared to set up any shows for only 15 passangers who are now only thinking about the coming ride through the desert…. 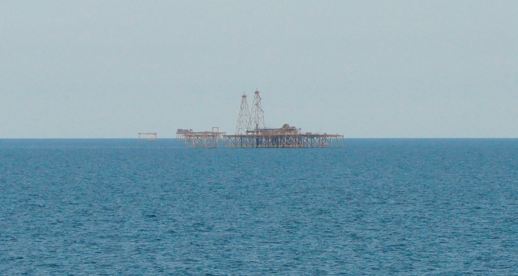 On Monday afternoon we could see land on the Kazak shore of the Caspian Sea and we all hoped we would be able to get off the ship and cycle into town to buy some supplies for the coming days. 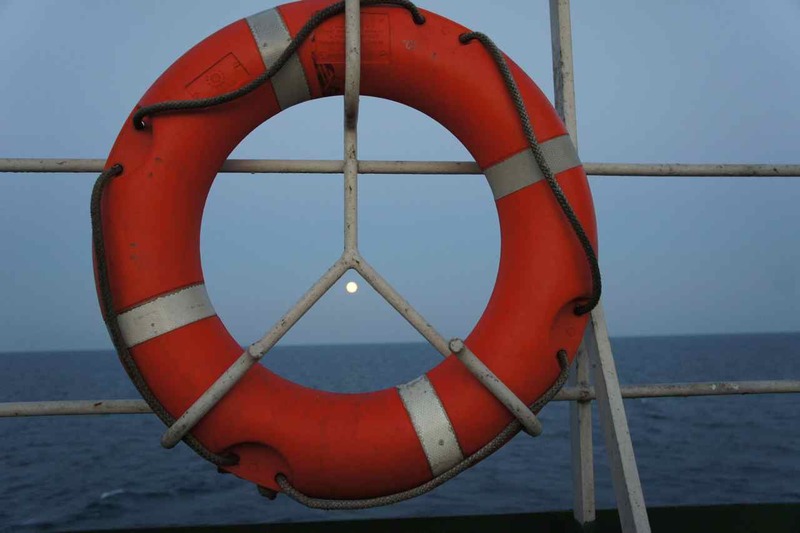 Then the captain dropped the anchor……. 🙁 Soon after we were informed that there were no available space for our ship in the docks and we had to wait until perhaps 10 PM on Monday evening. Arriving to a new country and city that late is not very pleasant and we asked if we could stay onboard until Tuesday morning. The captain said he would try to see if it would be possible to arrive later and after an hour or two we got the message we would arrive early Tuesday morning instead. When we were loading our bikes on early Tueday morning to be ready to disembark, we got new information telling that there harbour workers had a shift change and that we would have to wait 2-3 more hours before being able to leave the ship and go to thorugh customs which they say will take around 3 hours. The very long wait for the ferry and the 46 hour long ferry ride itself has been interesting. In our western societies time is money and we are not used to wait for something to happen sometime which could be this afternoon or three days later. We want exact dates and times and feel unproductive and get restless and upset when there is no reliable information available about when things can be expected to happen. I have during my trips to other far away countries often found that people seem to be able to not get restless when they wait for something to happen. Things will happen when they happen and maybe we stressed westerners who always want to be productive have something to learn. 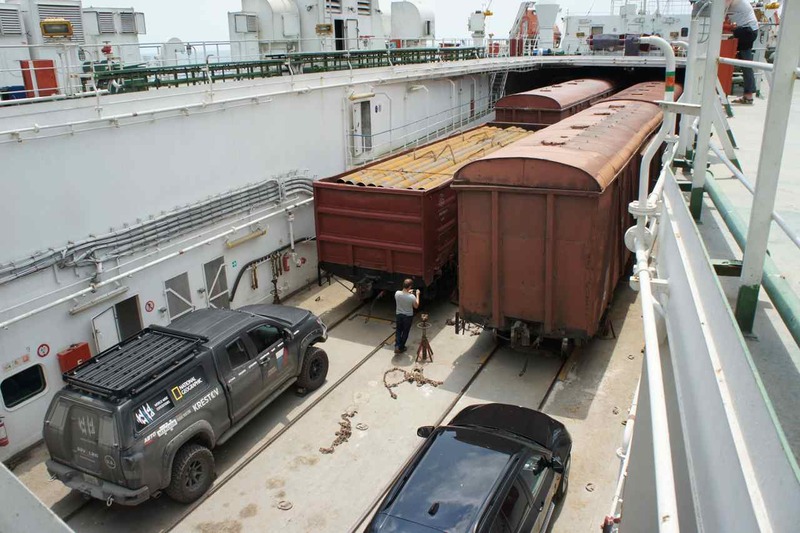 At least for us the experience with the ferry across the Caspian Sea has been a good lesson of how life is for many people around the world and I think we all have learned quite a lot from it this part of the adventure. This entry was posted in Posts in English on June 30, 2013 by admin. We submitted our visa applications at the Kazak embassy when it opened on this Tuesday morning. The officer told us our visas would be ready by Friday which was one day later than we had hoped. The good news was that he didn’t keep our passports during the time. 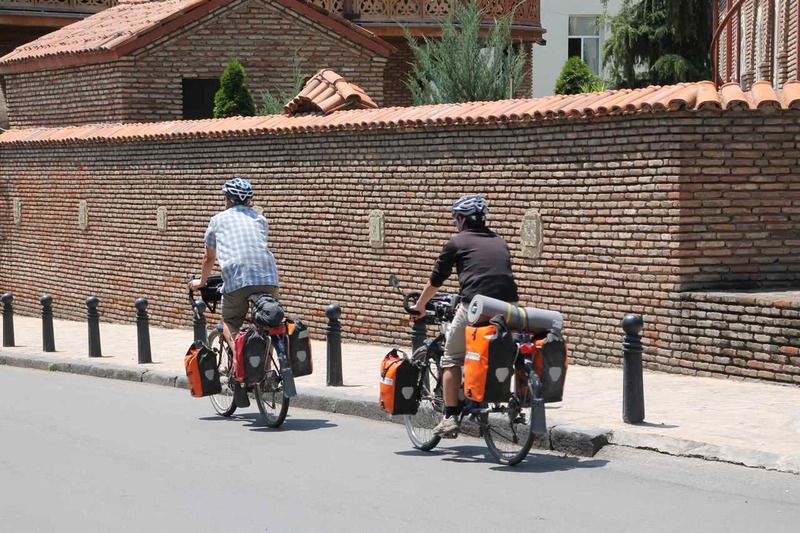 The following day (wednesday) the three cyclists we got to know in Tbilisi came to our hostel. We met Bartek (Poland) first time at the guesthouse in Batumi and first time we met Simon (New Zealand) was at the gas station outside Gori when Wej’s knee problem had got worse. They were riding with Marko from Slovenia who we met when he rested in the shade of a tree outside Bojormi. 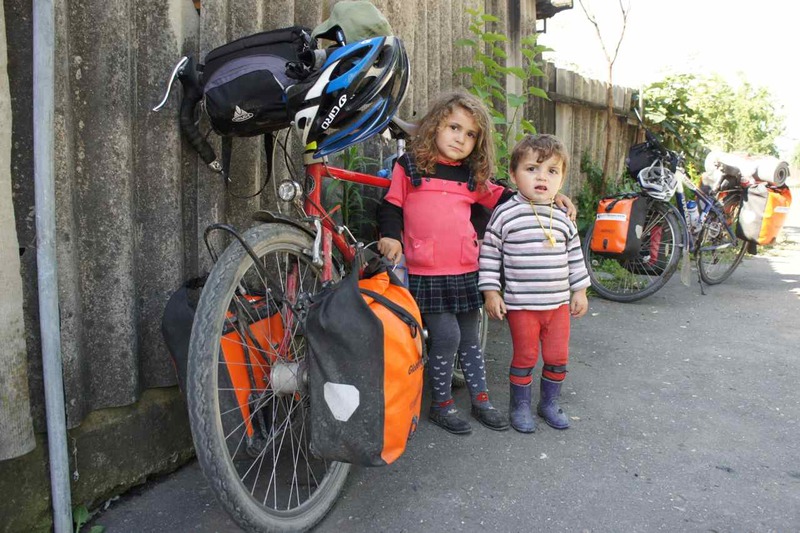 They had cycled together from Tbilisi to Baku at high speed to be able to apply for some central asian visas before the weekend. Sine they had gone too late to the embassy the consul told them to come back to pick up their passports the following day when the embassy’s consular department actually was closed. 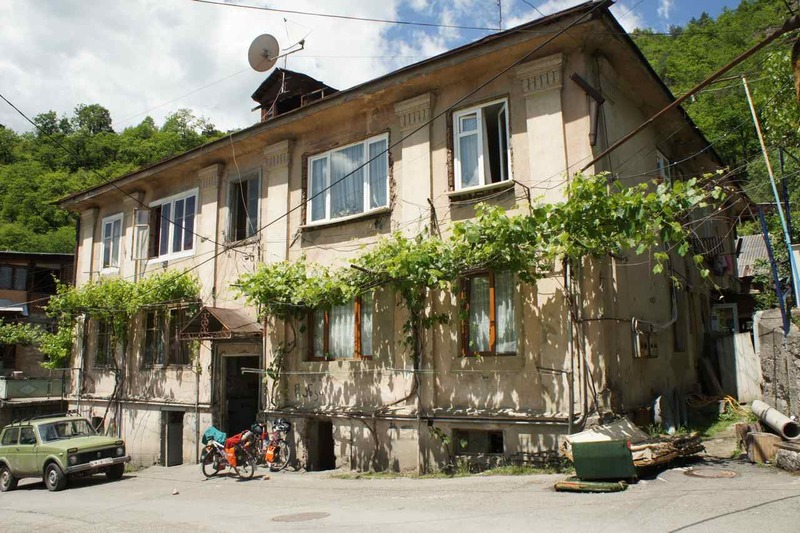 When we all returned to the hostel we had got our own LOI e-mailed to us two days quicker than promised. The owner of the hostel told us there would be a ferry sailing to Kazakstan on Friday and this message was great but even if we now had our LOI:s we still had to get the visas. The Uzbek embassy was going to be closed the following day (Thursday) but since our friends had made an appointment to pick up their passports we joined them to get inside. Once we were there the consul wasn’t too happy of seeing more visitors outside opening hours, but he was kind enough to grant us our visas on the spot too. 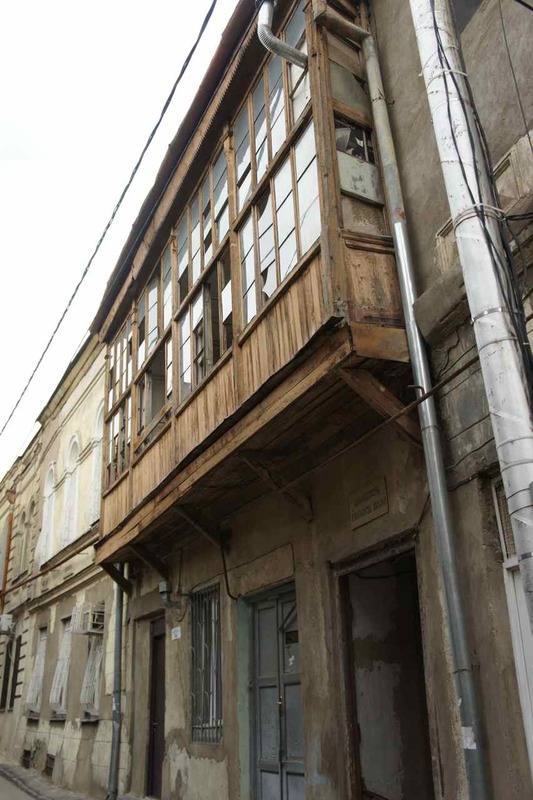 With our Uzbek visas stamped into our passports we hurried to the Kazak embassy. It was only Thursday and the passports wouldn’t be ready until Friday, but we took a chance. The consul immediately recognized our faces and said ”I told you to come on Friday, but I will check if your visas are ready”. We waited patiently outside his office and when we heard the sound from his printer the hope of being able to sail on the same ferry as our friends grew. Our passports had now visas for Kazakstan, Uzbekistan and China and I felt just as relieved as after having a tough test a university. It was party time….. 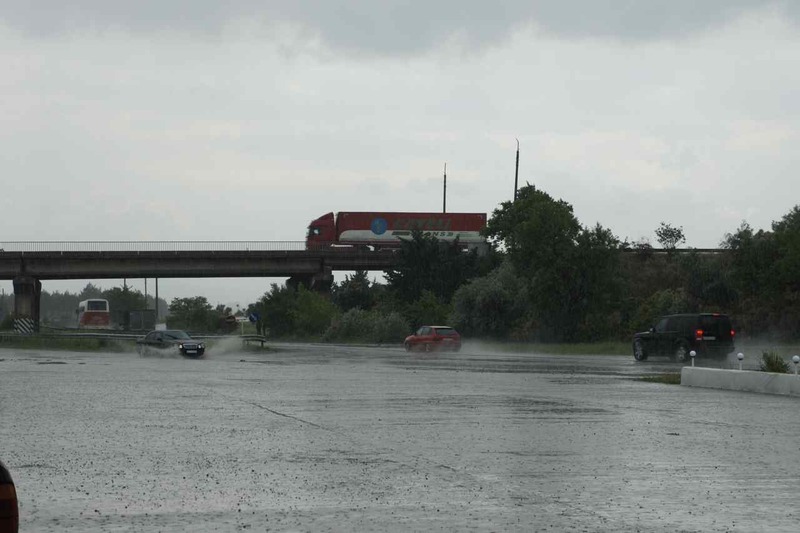 In the Friday morning we got the news that there wouldn’t be a ferry to Kazakstan that day after all. 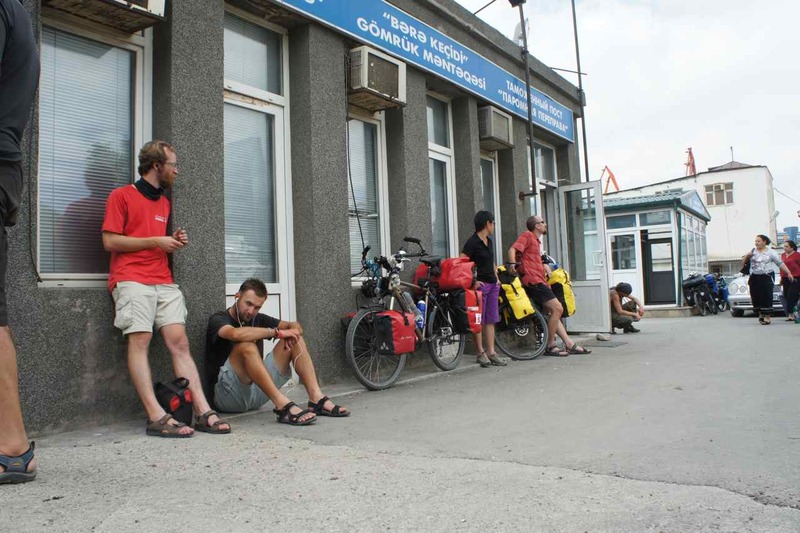 We are 7 cyclists at our hostel who want to get across the Caspian and we discussed what to do. 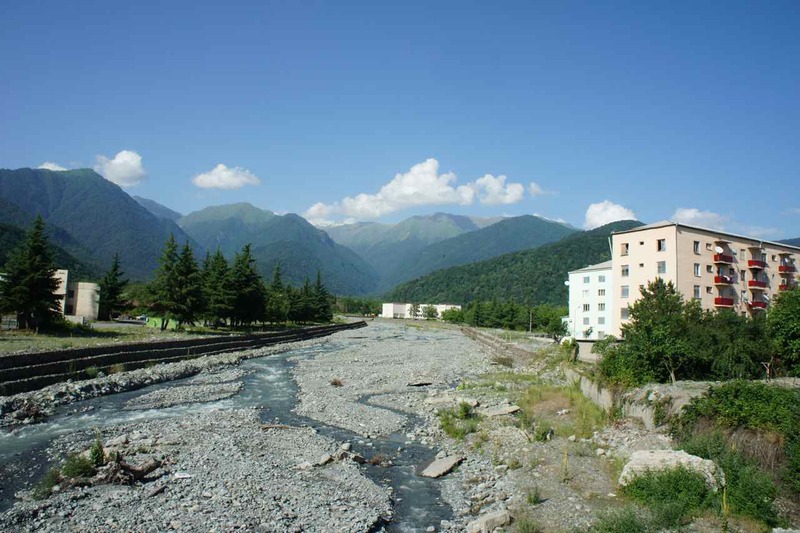 Some of us were under more time constraints with their Azeri visas soon expiring and the thought of flying across the Caspian once again returned. When I write this it is Saturday afternoon and we have got information that a ferry is on its way into harbour and that we should be at the ticket booth at 8 PM. 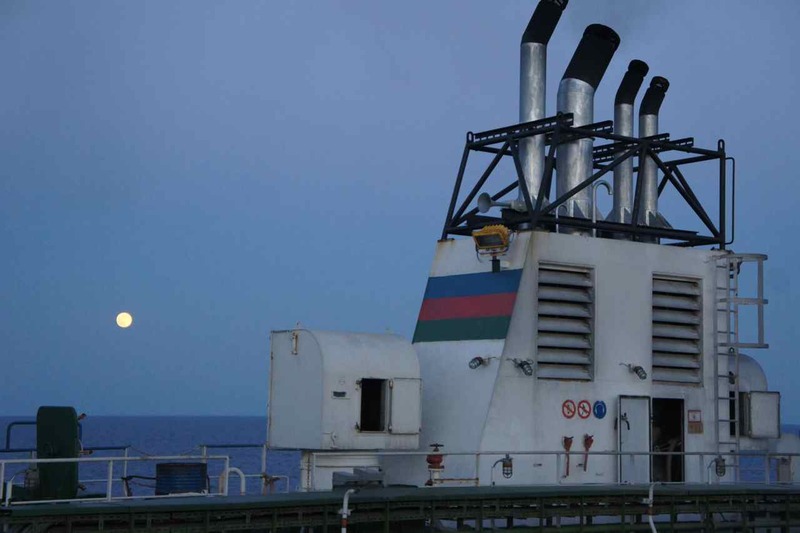 We hope that the ferry will sail some time during the night and arrive in Aktau on the Kazak side of the Caspian Sea during Sunday or early Monday. 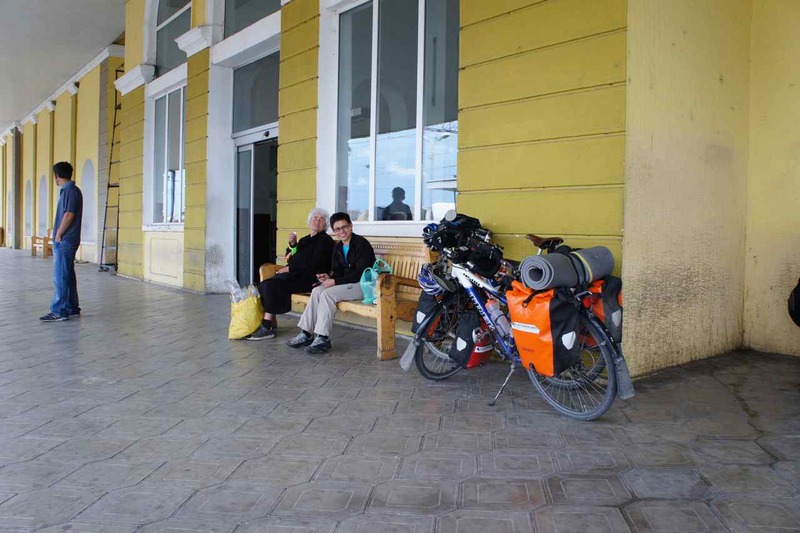 From Aktau we expect some rough riding through the dessert to the town of Beyneu. 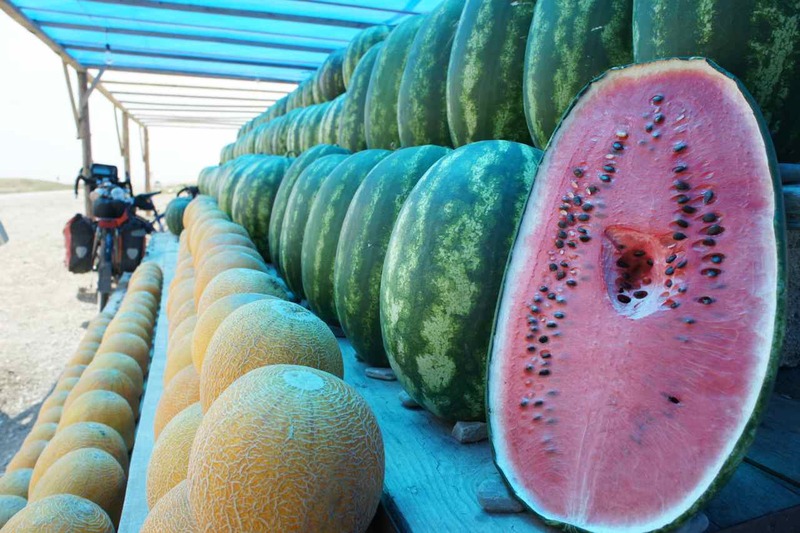 It is 400 km through the dessert. 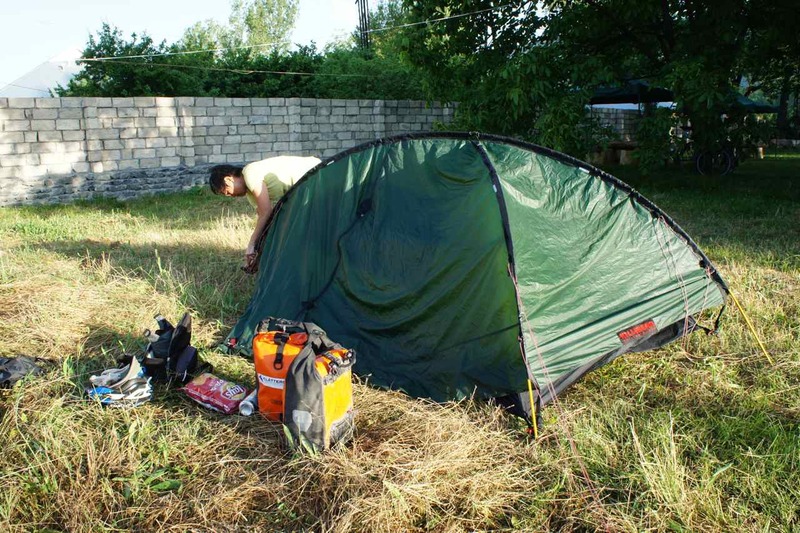 Our plan is then to take one rest day in Beyneu before continuing on an even more horrible road to the Uzbek border. Uzbekistan requires travelers to register every 72 hours. The registration is done by checking in to a hotel where foreigners are allowed to stay. From the border to the nearest point of registration it is 370 km of pure desert so we are looking forward to some interesting days of cycling. This entry was posted in Posts in English on June 22, 2013 by admin. 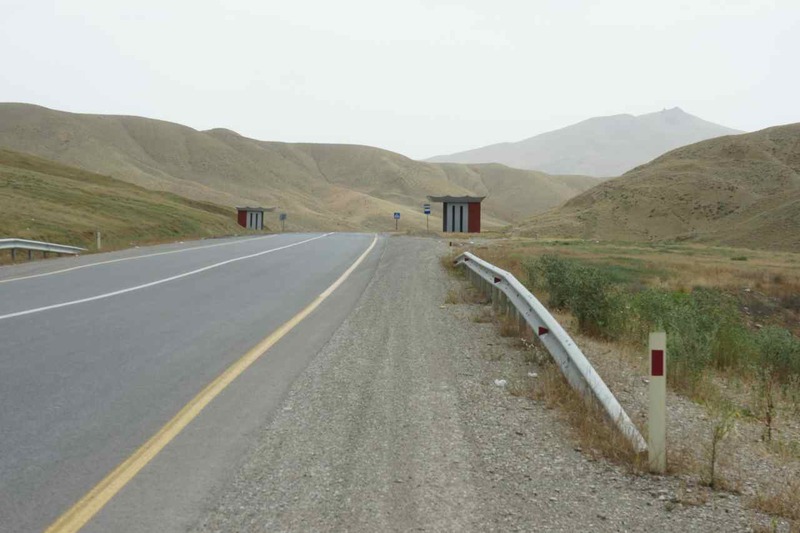 The last few hours up to the border to Azerbaijan was slightly uphill and the heat was intense. We spent our last coins in the Georgian currency Lari by buying 4 pieces of chewing gum at a shop 50 meters from the border. A georgian border guard asked for our passports, flipped through my passport several times and asked if I had another passport too. I do have a second passport but that was already delivered to Baku and I couldn’t understand the reason for his question. 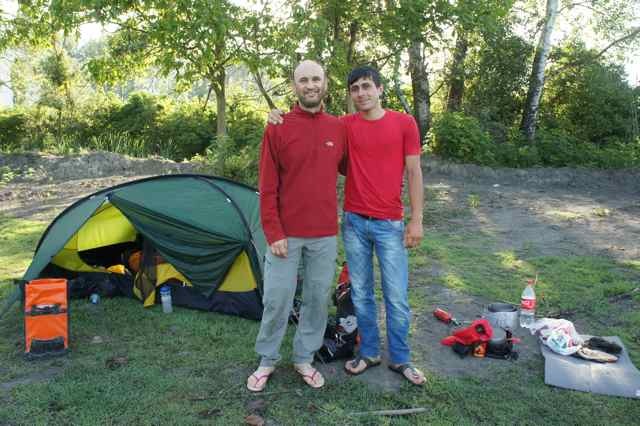 I replied ”June 20, at the border south of Batumi”. The officer then told me there was no entry stamp in my passport. He flipped through the pages once again and then he looked closely at the azerbaijan visa sticker and told me that it looked like the azeri consul must have put the visa sticker right on top of my entry stamp to Georgia. He mumbled something about ”stupid consul” and told me it wasn’t my problem, took my passport and went to check my entry date in his computer system before givingin me my exit stamp. Georgia is a country I have started to like. 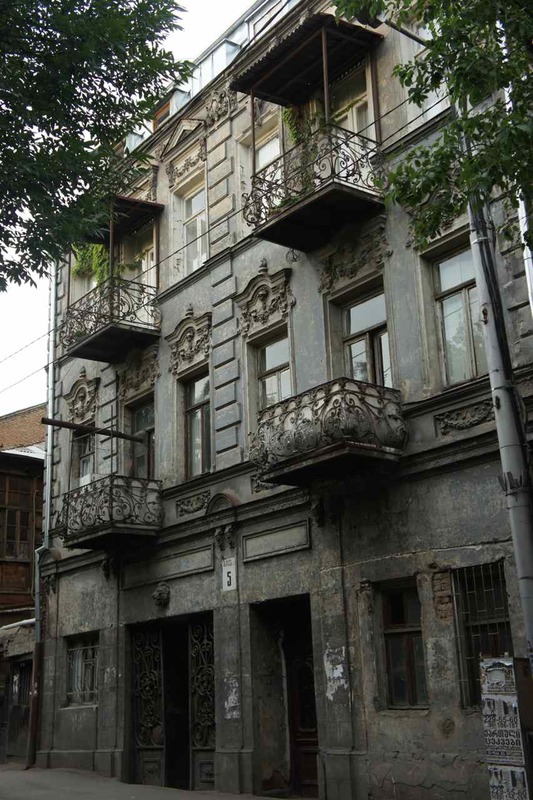 They have made big progress when it comes to moving the society away from the old soviet heritage. 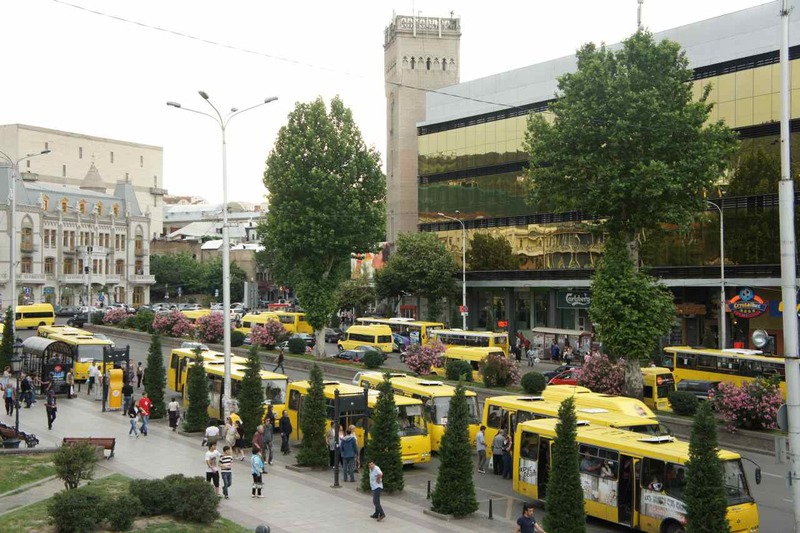 One thing I learned during my stay was that just like elsewhere in the former soviet union corruption was rampant in Georgia. In 2005 the government took the drastic decision to fire 95% of the police force and start over with new officers who got a salary increase of several hundred percent. I bet there were lots of influential people who were not so satisfied with this but now Georgia’s police force is ranked as being on western european level when it comes to corruption. Our entry into the country was late in the afternoon and we stopped in the first city to get some cash before continuing out of town to find somewhere to pitch our tent. We found lots of potential camp sites but they all had some drawbacks, but during a fast speed down a hill Wej dropped one of her water bottles and when we stopped to pick it up we saw a great camp site just some 50 meters beside the road. We love eating good food but we let professionals take us on culinary excursions in the local cuisine. When we cook ourselves we stick to some simple basic food and today was the third day in a row when we ate spagetti with a sauce consisting of tomato paste, onion and fried salami. Good taste, but it starts to be boring by now. In the morning we found out that we had camped in a field where cattle graze and as we were preparing our morning coffee we saw one, two, three and many many more cows coming walking through the gate into the field where we had stayed. Behind the long row of cattle was a guy on a horse – a true cowboy. He closed the gate behind the cows and came over to talk to us. As usual the language barrier was too great to overcome, but this was a cowboy of the 21 century. He soon pulled out a smartphone of his pocket and we could communicate via his google translate app….. The cowboy told us to drop by his house further down the road and have a cup of tea and then left us. Half an hour later when we were cycling along the road we heard the sound of a galloping horse behind is. It was the cowboy who was anxious we would miss his house and had hurried to catch up with us. The cowboy lived with his grandmother and brother’s family in a small house. his grandmother was a colorful and decisive old women who countiously shouted out orders to the people around her. The cowboy just nodded and smiled to us as a sign of not taking her seriously. 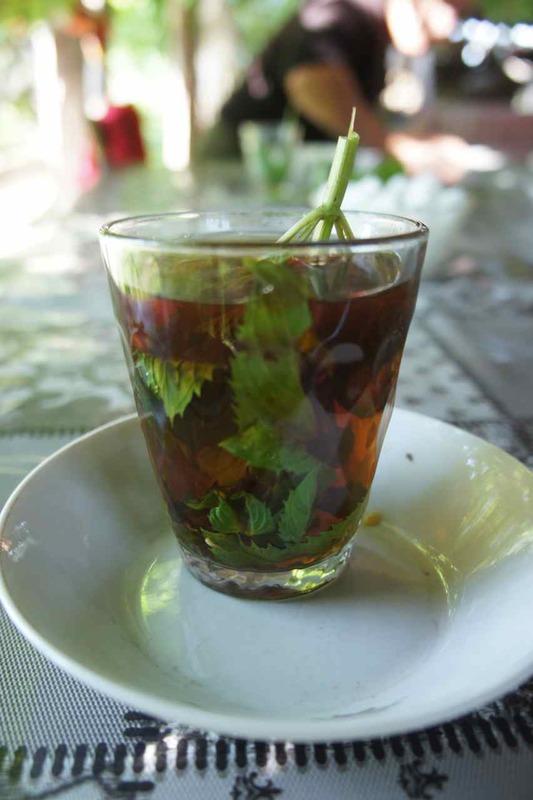 Just like in Turkey they served their guests tea but here they but some leaves of mint in the tea glass to make it mint tea. 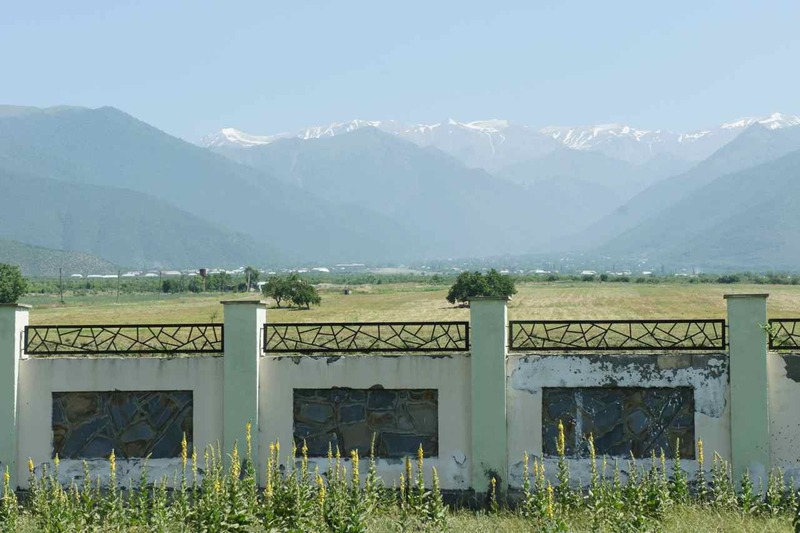 After having some tea we continued our ride along the valley with the snow capped mountains of the great Caucasus on our left. 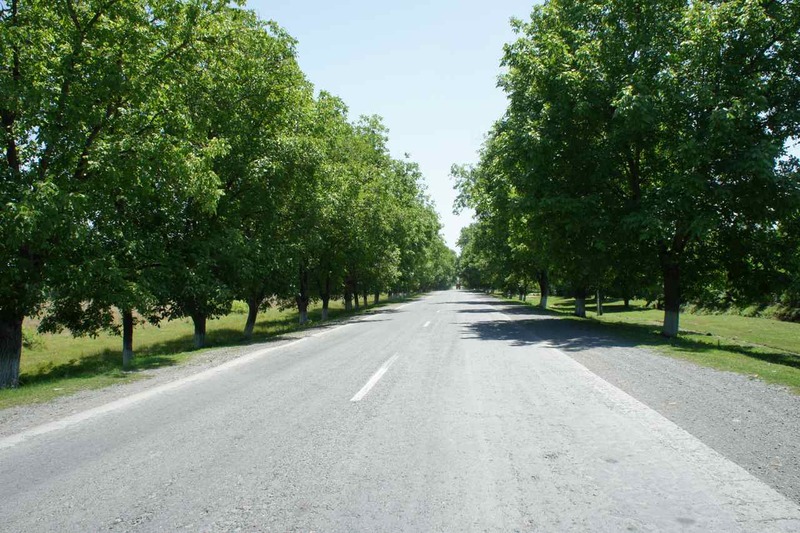 The landscape was very green and we very often found ourselves riding through alleys with large trees on both sides. We rode through Georgia with an simple map we got second hand from a Thai touring cyclists we met in Batumi and it worked fine. 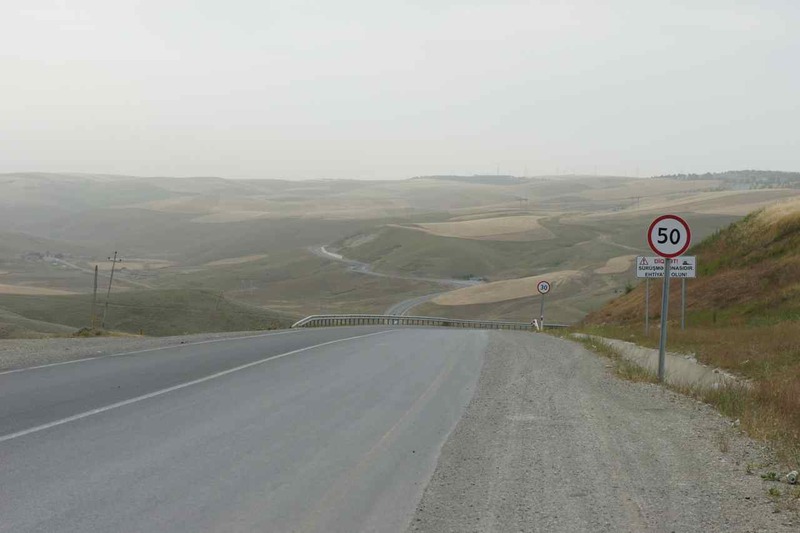 When we entered Azerbaijan we didn’t even have a simple map – we had none and just follewed the road signs. While we still were on the Georgian side of the border we could see mountains growing bigger and bigger as we got closer and once inside Azerbaijan we rode parallell to the mountains. 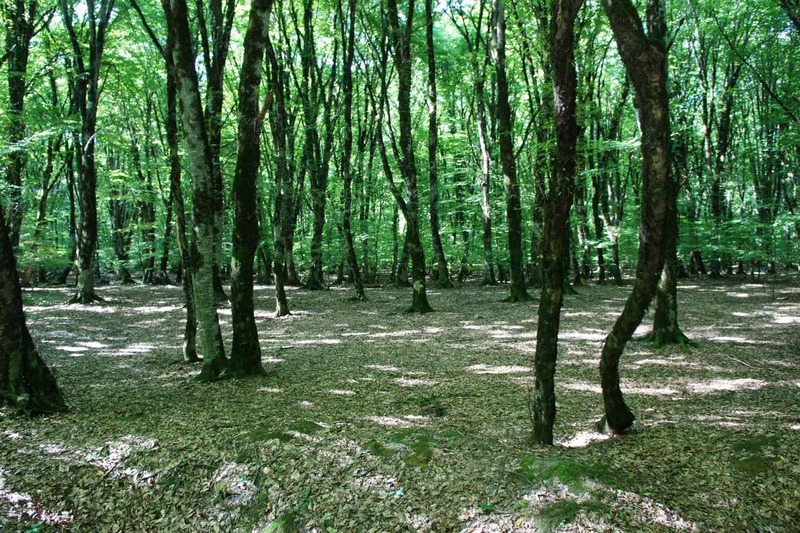 The first few days the landscape was very green and there were forests everywhere and cattle were grazing on the grassy fields. 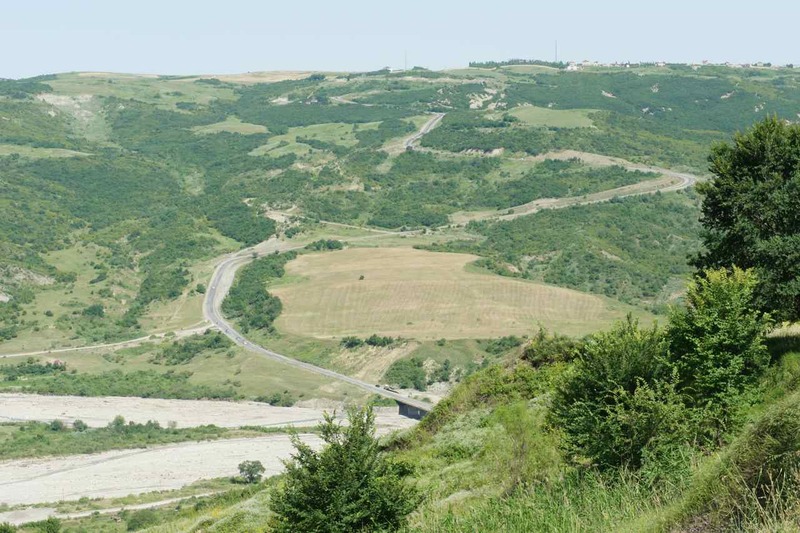 We highly enjoyed this kind of landscape but 1,5 days before entering Baku the landscape changed dramatically. After a giant climb to Gabala city it was time to find somewhere to sleep and we ended up at a little local bakery just outside the town. We asked the owners if we could camp in their garden and they didn’t only allow us to stay there. They also provided us with fresh bread. On our fourth day in Azerbaijan the landscape changed from very green to a brown, dry semi dessert. 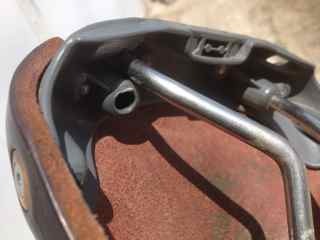 The shade was gone and the heat got even worse. Our plan was to get to the city of Samaxi where we would try to camp. We knew there would have to get across a valley with a steep downhill followed by just as steep uphill section. It wasn’t hard to ride down, but the climb out of the valley was the steepest so far on our journey. It was in fact so steep that we almost had to push the bikes. We rode at 3-4 km/h and often stopped to rest. In Samaxi we soon found another AZ Petrol station and we stopped to wash ourselves at their restroom. When the owner asked where we were going to stay we quickly asked if he knew where we could camp. He pointed to a lawn just across the street. Since our plan was to start riding at 5 AM we thought we could as well just sit and sleep at a hidden corner at the gas station. After having had dinner at the gas station’s cafe the owner suggested we could sleep in the prayer room of the gas station. We parked our bikes inside the prayer room and then fell asleep on the thick carpets. Riding into Baku was rather uncomplicated. The city only has 2-3 million people and we followed the signs into the centre and then used our map from the guide book to get to the hostel in the old town that we had planned to stay at. This entry was posted in Posts in Thai / โพสต์ภาษาไทย on June 21, 2013 by admin. Georgia isn’t a very big country and when we arrived in the country on May 20 we only planned to stay for about two weeks before continuing to Azerbaijan. Then two things happened that would slow us down. First Wej fell and hurt her knee and then we discovered we had made a mistake when providing information to the travel agency that would make the letter of invitation to Uzbekistan. All this made us have to wait and all the waiting have been frustrating. We have been in good company though and met plenty of other cyclists from many countries. I knew of 12 other cyclist being in town at about the same time. 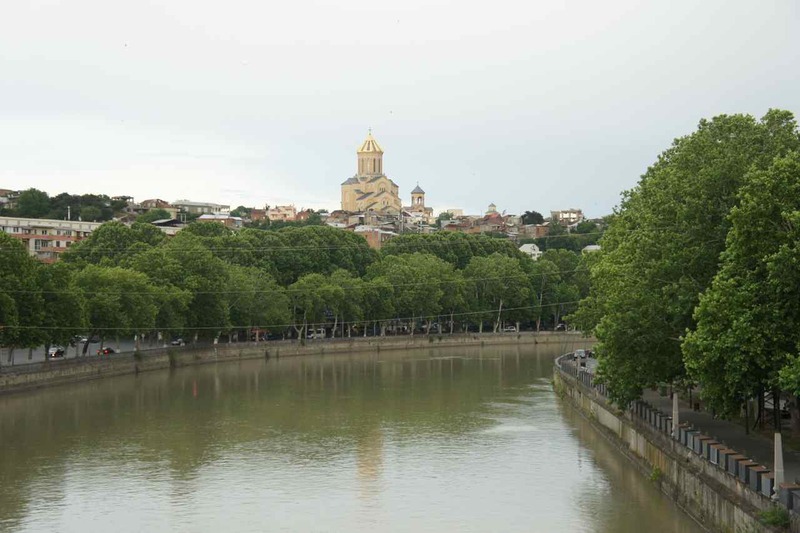 It felt like Tbilisi was the gathering point for the cycle caravan going to traverse the silk road. 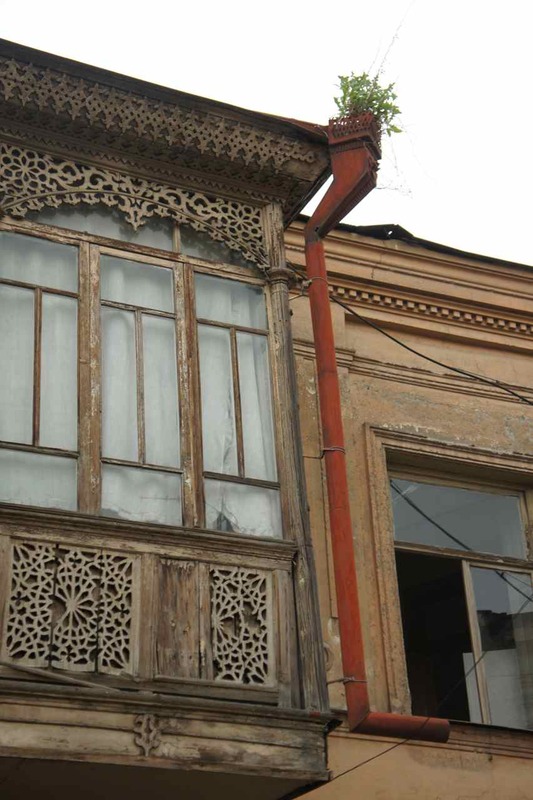 Wej and I were in no rush since there was a delay with the letter of invitation to Uzbekistan and we postponed our departure from Tbilisi one day at the time since her knee wouldn’t stop aching. 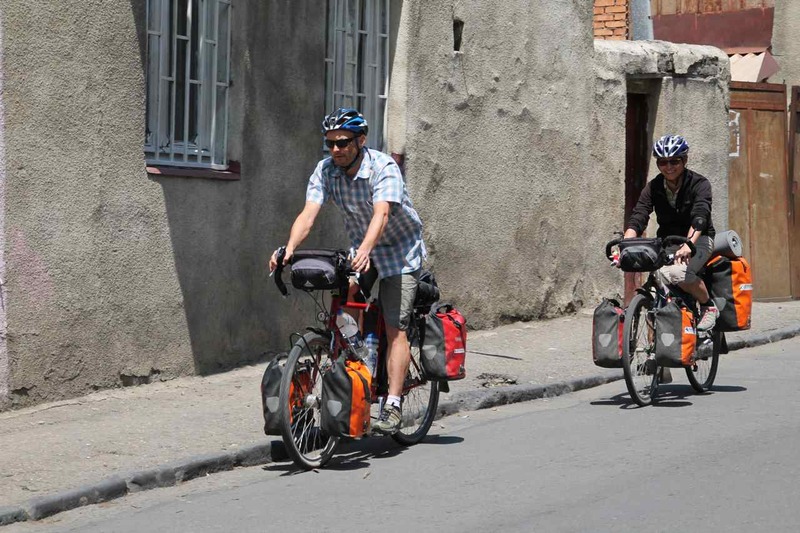 When we finally left Tbilisi last Tuesday (11 June) our aim was to make a soft start and only ride for a few hours. It was raining the day before we left and when we finally got into our saddles the sky seemed to promise rain sooner rather than later. 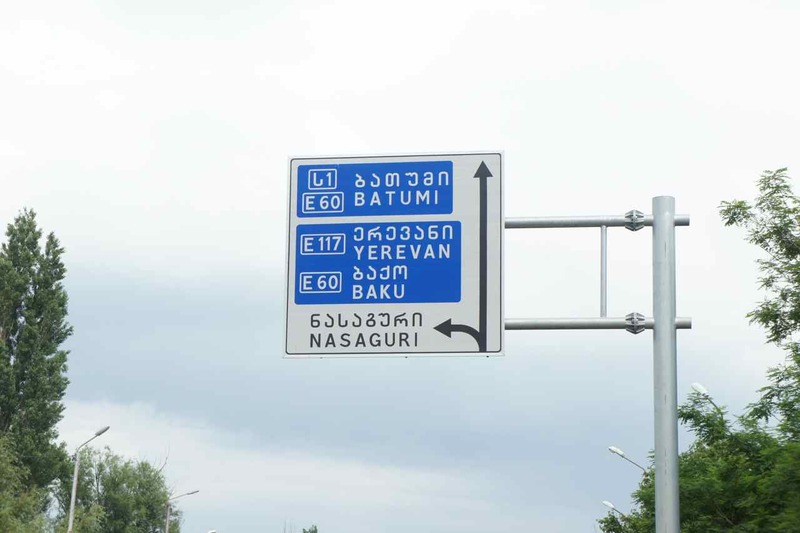 Road sign outside Tbilisi showing directions to exotic cities. 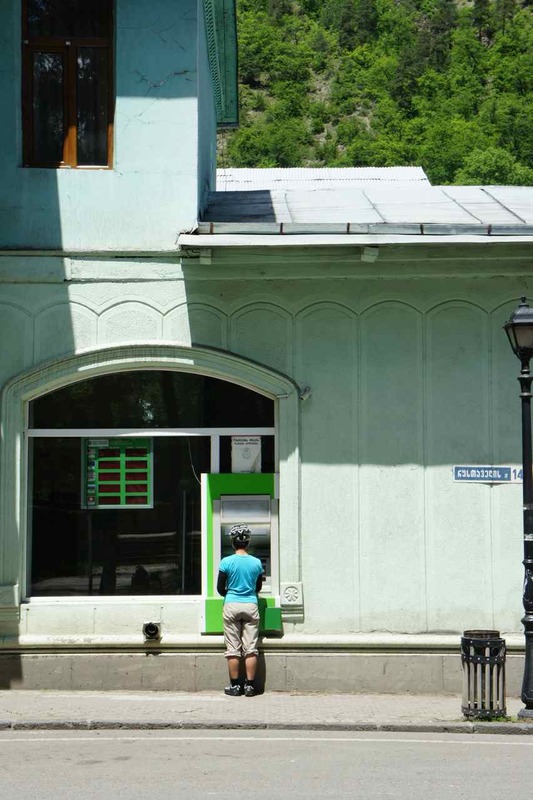 At the outskirts of Tbilisi we caught up with another cyclist. 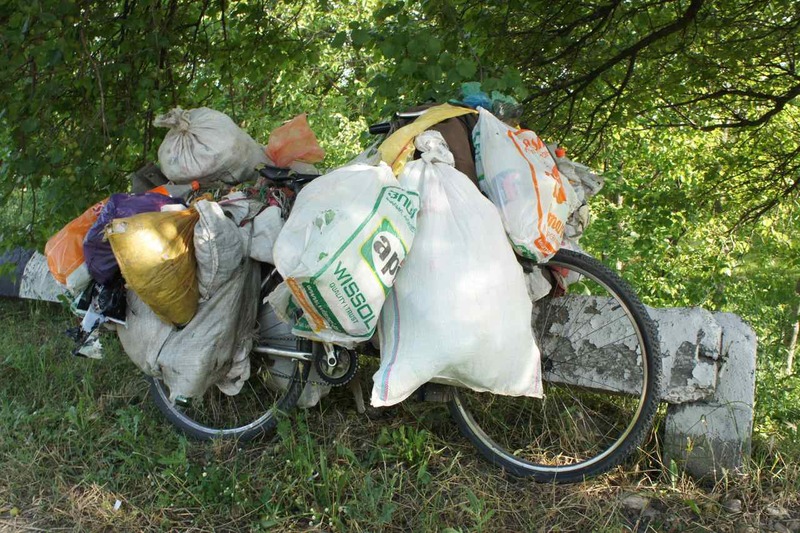 It was a man in his late 50:s who had lots of plastic bags hanging from his bike. We exchanged a few words as we rode past him, but when we later stopped he caught up with us and came over to talk to us. He didn’t know any english but spoke german, italian, russian and spanish. He tolds us he was on his way to Sighnagi which happened to be our target too. 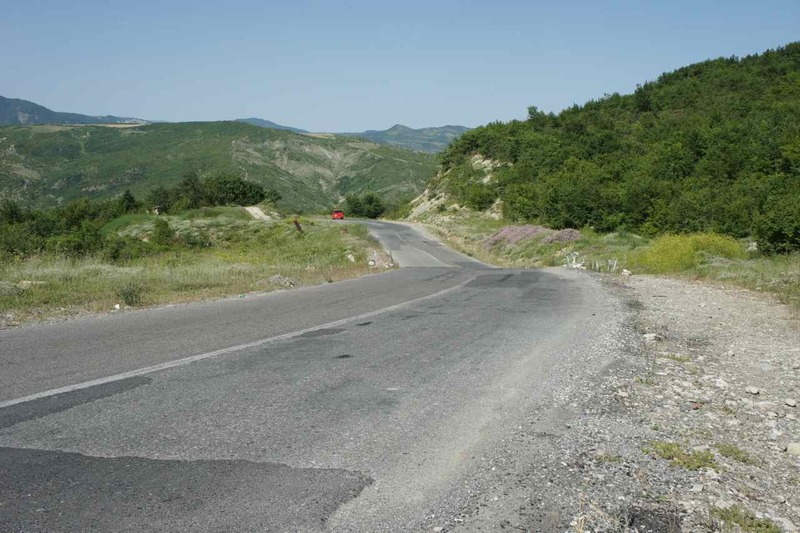 The road out of Tbilisi was slowly taking us uphill and we cycled very slowly and stopped often so Wej could do stretching and massage her knee. It all went quite well but after about one hour her knee started to ache again. This made us seriously concerned and we decided to take a break to rest somewhere. At about the same time the colour of the sky changed from grey to black and we knew heavy rain was on its way and turned into a gas station to rest and wait for the rain. After spending about one hour at the gas station we decided to continue and try to find somewhere to camp, but only 5-600 meters after the gas station we found a little hotel. Our plan was to camp but the aching knee had put us in low spirits and we decided to stay there. 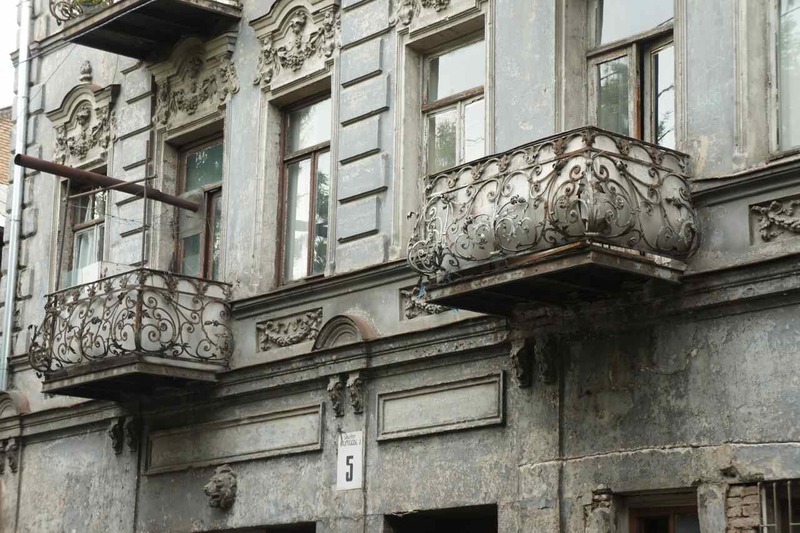 The owner thought his hotel was a nice one and bragged about the night club, but we were not so convinced that it was a good hotel since the bathroom stank and had almost no water pressure. We could clearly hear the loud music from the night club during the late hours, but when we walked past we could see there were no guests there…. The unplanned night at the hotel made us want to save some money which we did by cooking dinner in the room. The next morning Wej complained that the pain in her knee hadn’t gone away and this worried both of us seriously. She did stretching, massaged the knee and did what she could to relieve the pain. We spent several hours in the morning discussing what to do and we ended up in a common decision to return to Tbilisi and have a doctor look at the knee. This decision was not easy to make and I think we both were anxious about the consequences this would have for the rest of our journey. It was already noon when we finally got the bikes loaded and when we were about to cross the road and roll back to Tbilisi Wej said that we could try to bike a couple of kilometers first before we turned around. There was a long but not so steep uphill immediately after the hotel and when we had climbed it Wej said that she didn’t feel anything in her knee and we decided to continue a little more. The vagabond’s bicycle the second day we met him. The load had grown. 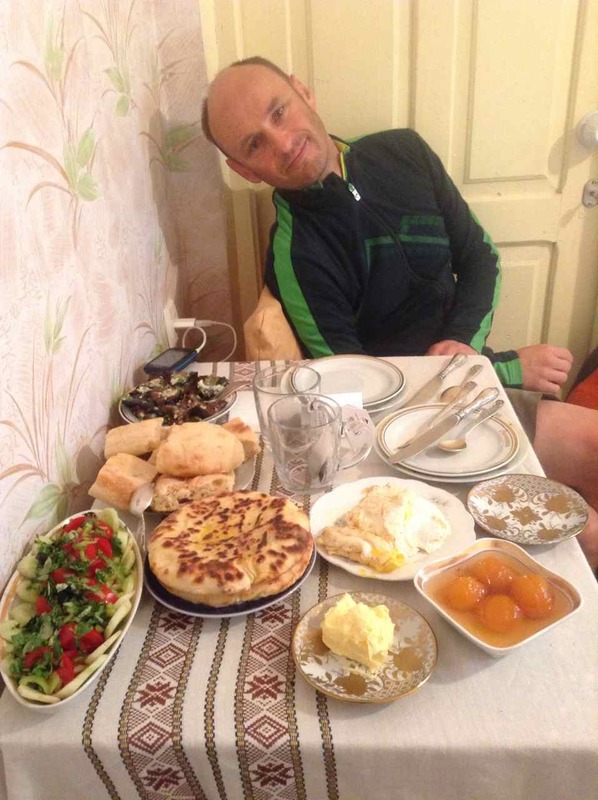 In the late afternoon Johannes – a german cyclist we had met in Tbilisi – caught up with us. 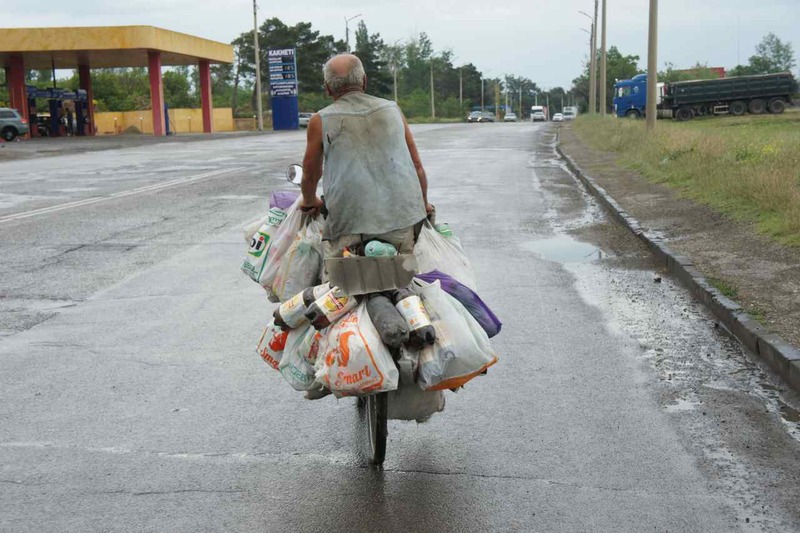 We rode the rest of the day together and all of a sudden we once again caught up with the vagabond collecting empty bottels along the road. 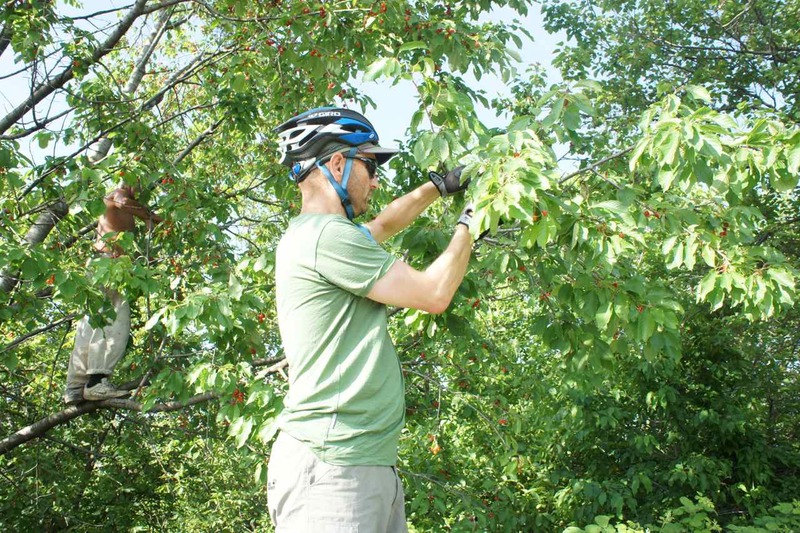 The vagabond told us there were cherry trees a couple of hundred meters ahead and we all stopped there to eat cherries picked straight from the tree. 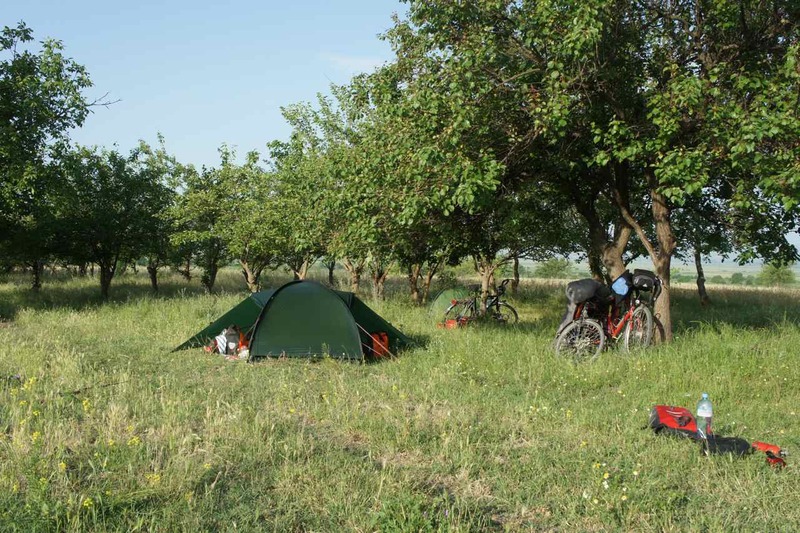 We decided to stop early and pitched our tent beside Johannes in an orchard with unknown fruit trees. The following morning my rear wheel was flat. I think I had parked on something sharp. Normally this shouldn’t cause the tyre to get flat, but maybe my tyres were in worse condition than I thought when we set out on this tour. It makes me a bit concerned since it is hard to find high quality tyres in these countries. This entry was posted in Posts in English on June 20, 2013 by admin. This entry was posted in Posts in Thai / โพสต์ภาษาไทย on June 18, 2013 by admin. โจคิมคุยกับพวกเขาทางอีเมลย์คุยกันไปเมลย์กันมาก็เห็นว่าบาเทคกับไซมอนอยู่ที่โฮสต์เทลเดียวกัน เราเลยตัดสินใจย้ายไปอยู่กับพวกเขาหลังจากที่ทอมและนิคออกเดินทางไปเมืองบาคุ เมืองหลวงของอัซเซอร์ไบจานได้สองวัน อยากย้ายตั้งแต่วันแรกที่พวกเขาปั่นกันไปแล้ว แต่ขี้เกียจแพ๊คกระเป๋า มีตั้ง 8 ใบนะ 🙁 มาตัดสินใจได้เพราะมีดึก ๆ คืนหนึ่งไฟดับ อีตาคนเฝ้าเอาเทียนออกมาจุด 4-5 เล่ม อ้าว…วางทุกจุด เกิดมันล้มไปติดไฟที่ไหนแล้วคนที่อยู่ในโฮสต์เทลจะทำอย่างไร ได้ฤกษ์แพ๊คกระเป๋า ย้าย!!! หลังจากที่เราได้ข้อมูลเกี่ยวกับการเดินทางของเอเดรี่ยน เราคิดว่าไซมอนและบาเทคน่าจะสนใจเลยนัดกันมากินข้าวมื้อเย็นที่โฮสต์เทลใหม่ เวลาส่วนใหญ่ของเราหมดไปกับการหาข้อมูลการเดินทางเส้นต่อ ๆ ไป แต่ช่วงนี้จะหาและอ่านกันเยอะหน่อยเกี่ยวกับประเทศคาซัคสถานและอุซเบกิสถาน เพราะเราคงได้เจอกับปัญหาเรื่องอากาศที่ร้อน น้ำที่หายากต้องแบกกันไปเป็นลิตร ๆ เวลาที่จำกัดโดยเฉพาะที่อุซเบกิสถาน ในวีซ่ากำหนดไว้ 30 วันไม่ขาดไม่เกิน วีซ่าออกวันไหนนับตั้งแต่วันนั้น และระยะทางที่ค่อนข้างยาวประมาณ 2000 กม. This entry was posted in Posts in Thai / โพสต์ภาษาไทย on June 16, 2013 by admin. 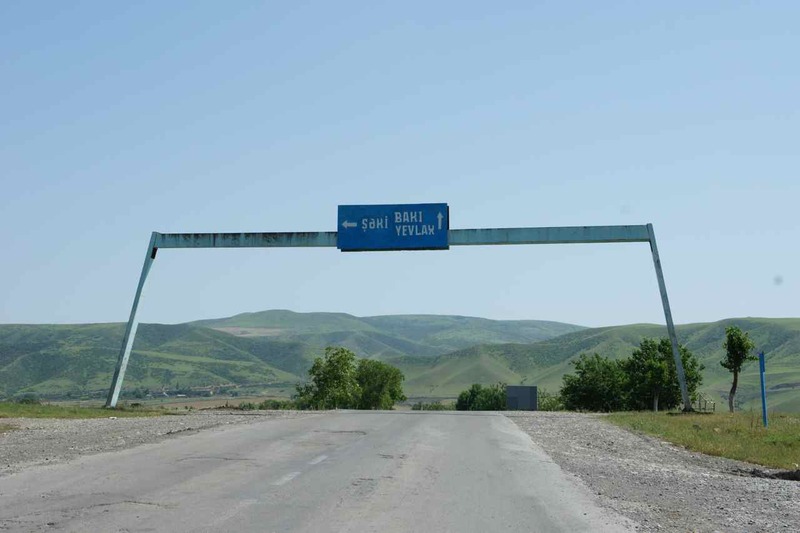 We are now in Azerbaijan at a gas station with internet connection in Gabala city some 220 km from Baku where we estimate to arrive on Monday afternoon. Wej’s knee works fine, the heat is intense and the scenery is stunning. More news will be posted in a few days. This entry was posted in Posts in English on June 15, 2013 by admin. 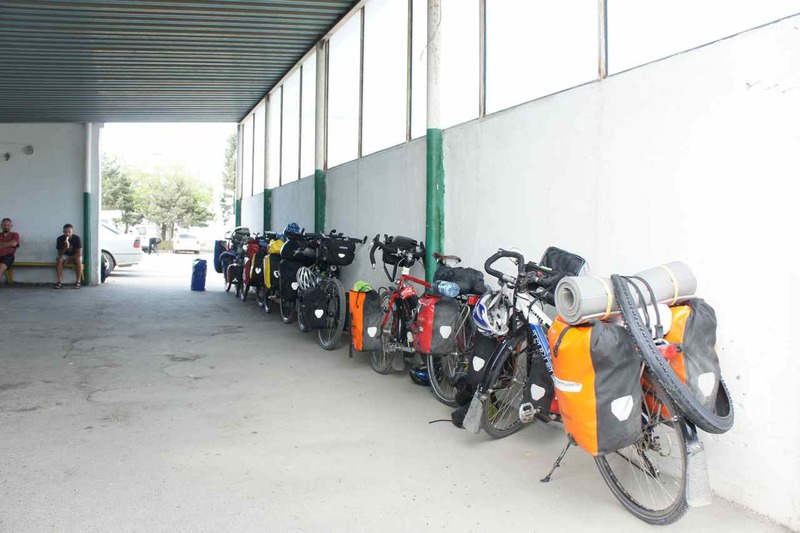 We have had the idea of cycling from Göteborg to Bangkok for at least three years and during these years we have read blogs and books about cross continental cycle touring. The ideas went from dreams to something highly plausible about two years ago and the decision to go was made about one year ago. 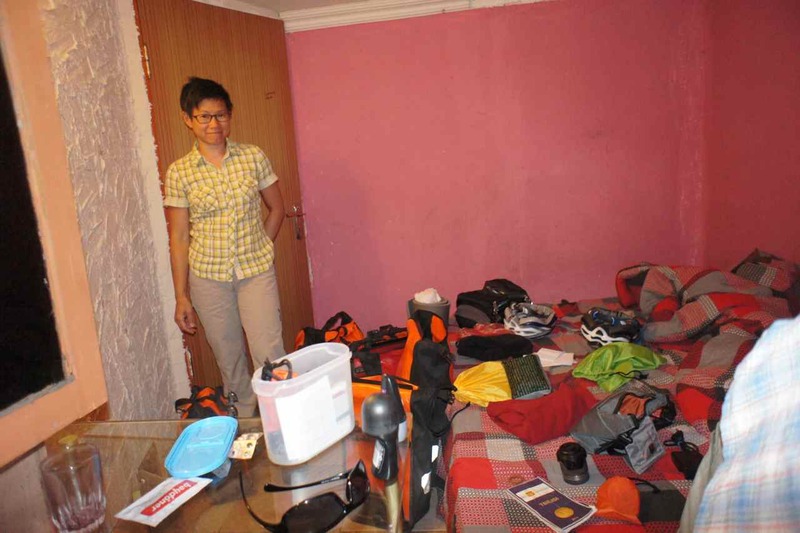 The last year we have carefully planned everything from choice of route to what equipment to bring. The route has been changed a few times and we have exchanged a lot of our old equipment in order to make our luggage lighter and less bulky. We knew what lay ahead of us and nobody could say that we did not know what we were heading into. We have flown across the euro-asian continent so many times that we have lost count and with a minimum of hassle and effort you will board an aircraft in Copenhagen in the night and arrive in Bangkok the following morning. This smoothness is all gone when traveling overland and everyone who has ever tried has run into the visa hassles of central asia. All this was known to us and we made our best to make a good plan for visa applications. We knew we would have to wait for the visa process somewhere so we tried to make it coincide with longer stops in cities we wanted to visit anyway. When applying for a Uzbek visa a letter of invitation (LOI) is needed and travel agents recognized by the Uzbek government can issue such documents. Already in April we contacted one company and they carefully informed us what we needed to do in order for them to be able to issue a LOI. When the LOI never came I checked our e-mail correspondance I found out we hadn’t sent in all required documents. We had forgotten to mail them the letter proving our employment and the clock hadn’t started to tick yet, but it does as of today…. Getting a LOI takes 10 working days and we can’t apply for the Uzbek visa until we have received the LOI which probably will be on Friday June 21. 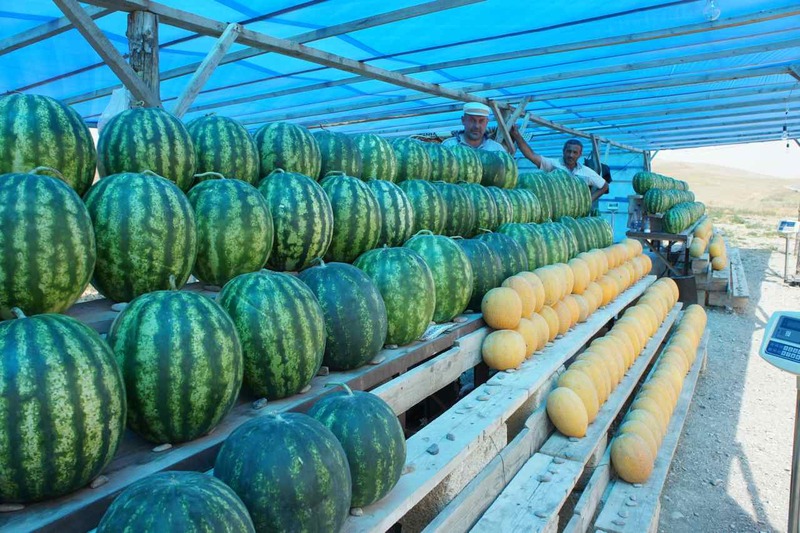 The Uzbek visa will then be ready around June 28. We still haven’t applied for our visas for Kazakhstan, but we will do that in Baku. Rumours say it is a straight forward process that takes 4 days since there is no requirement of letter of invitation. Our initial plan was to arrive in Baku today and start the visa process for Kazakhstan and Uzbekistan. 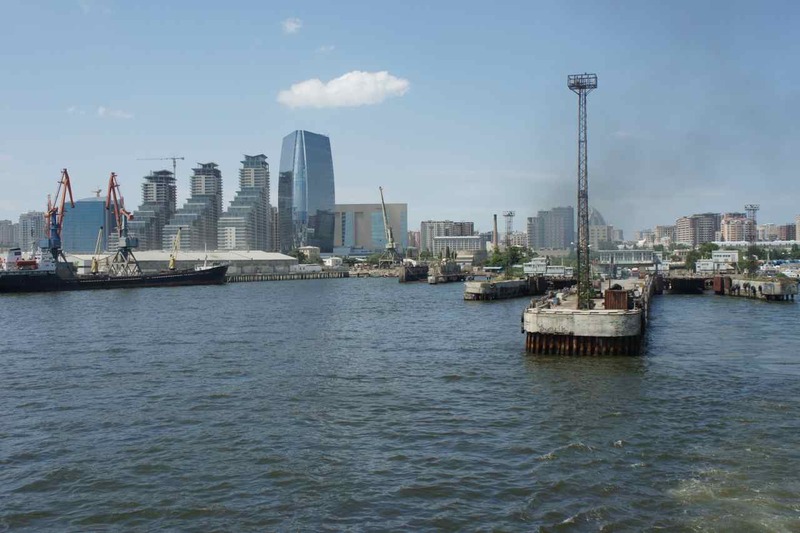 It will take around 7-9 working days to get both visas and then we would try to get on the unreliable ferry connection across the Caspian Sea. I got very upset when I understood that my negligence to provide all required documents will delay us with one week, but this mistake also provided us with an opportunity for Wej to let her knee rest properly. If everything would have been according to plan there would be a risk that we had pressed forward too early. We planned 10 days (Monday-Wednesday) for the visa process and then budgeted 7 days to get onto the ferry. 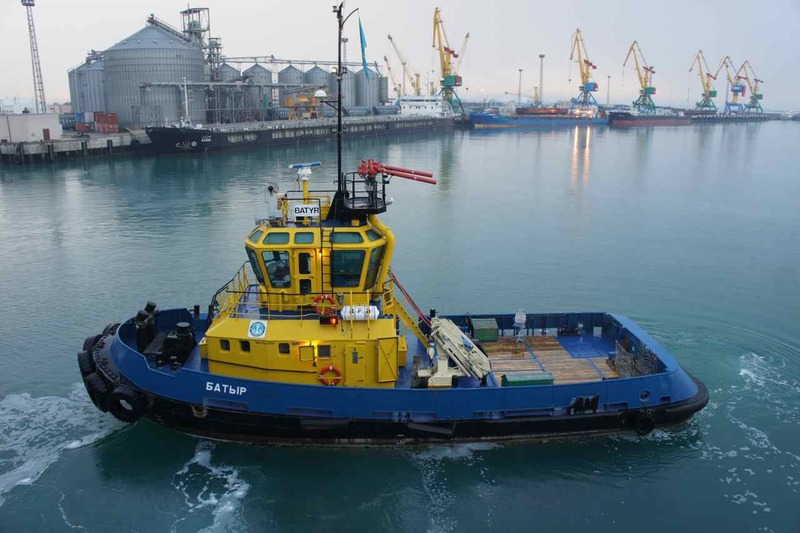 Now we will have to spend the 7 days waiting for the ferry to wait for the LOI instead and to make up for the time lost we will try to find a flight that will take us across the Caspian Sea. It is very frustrating to have to wait for nothing, but we are in good company of a lot of other travelers and cyclist who are stuck in the same situation. 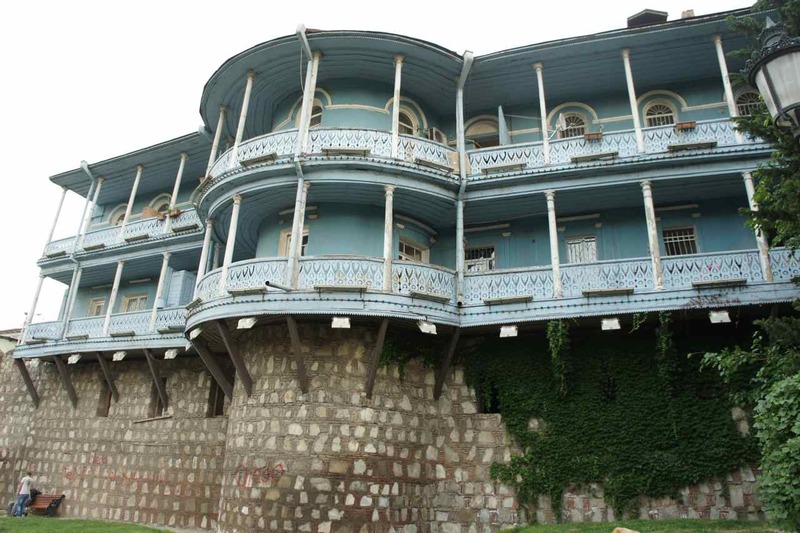 So there is not much to tell more than that we are stuck in Tbilisi…. 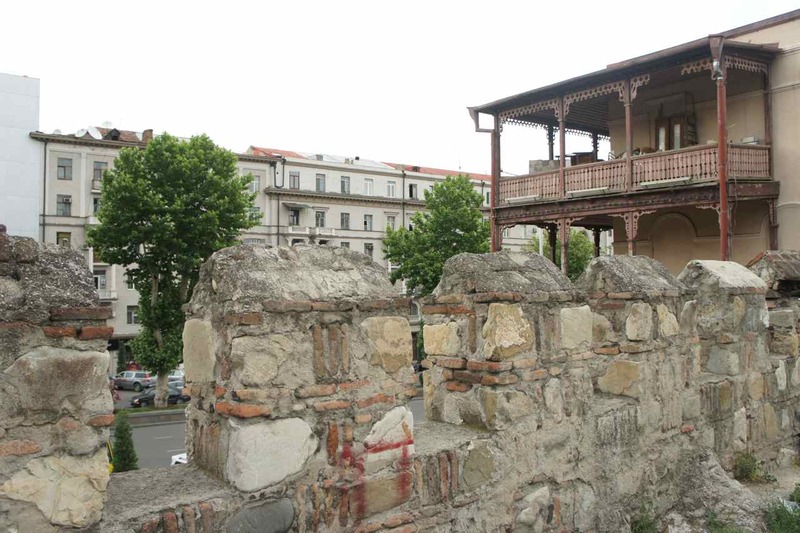 Meanwhile, please enjoy some photos of Tbilisi. We paid 20 GEL per night for the two of us (80 SEK, 9 €) for this little room in a not so well managed guesthouse. Beer and e-book reading on the ipad. This entry was posted in Posts in English on June 10, 2013 by admin. Leo’s Mum didn’t disappoint us today either. The breakfast was excellent just like the previous two days and today we were going to cycle so we really needed all that energy. It takes time to eat a big breakfast and then pack everything and load it to the bikes and we didn’t manage to leave until it was 11 AM. Huge breakfast for a hungry cyclist. I take care of most of the mechanical issues and navigation while Wej is in charge of the economy. Since we had stayed at Leo’s guesthouse longer than planned instead of camping Wej decided we needed more cash before leaving town. The cycling went just fine and soon we found another touring cyclist who sat resting in the shade of a tree. He presented himself as Marko and he told us he had started in his hometown in Slovenia 40 days ago and was going east for 6 months. 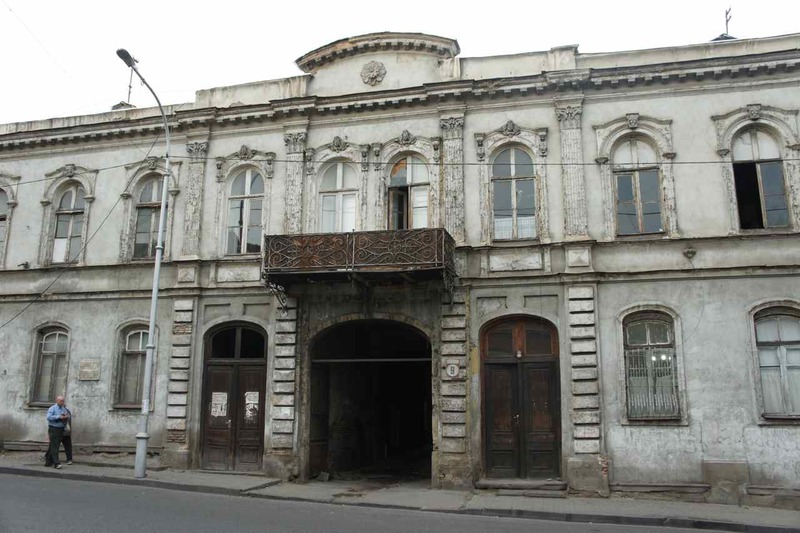 He was tired and needed to rest so we exchanged e-mail addresses and said we would try to meet once in Tbilisi. Borjomi is a small provincial town and the road to it has not much traffic but after the Bojormi road joined the big main road leading from east to west through Georgia, the traffic immediately got a lot more intensive. We had to go back to our routine of Wej riding behind always looking in her mirror and blowing her whistle to warn me about incoming trucks. The road had a shoulder to ride on, but it wasn’t sealed so we often found ourselves riding on the uneven gravel beside. It wasn’t fun and it was difficult. After a while Wej started to complain that her knee had started to hurt again. She had hit her knee when falling whilst crossing a creek on the mountain a couple of days ago. We had taken several rest days to let it cure, but now the feeling of uncomfort had returned. To have knees that don’t hurt is very important when cycling and we decided to stop as soon as possible and do the rest of the ride to Tbilisi tomorrow. 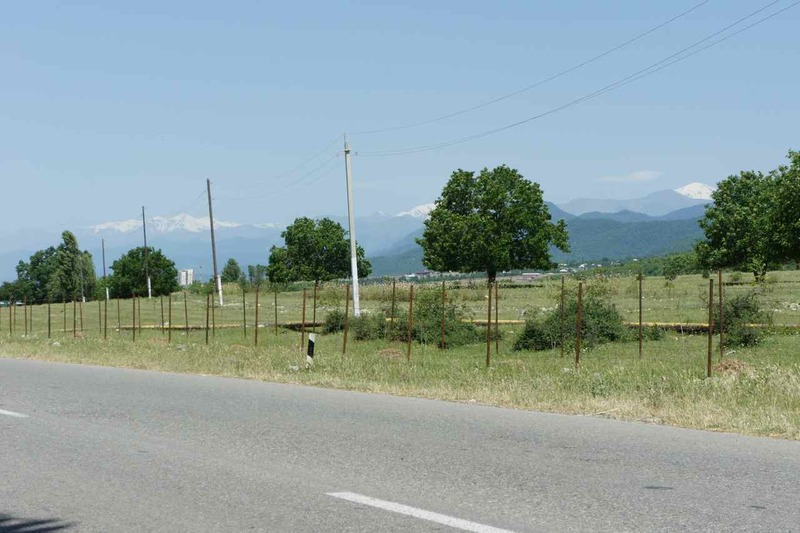 All of a sudden the bad road ended and was turned into a new 4-lane motorway with a wide shoulder to ride on and beside it some 7-8 km outside Gori we found a huge and very nice looking gas station with an adjacent restaurant and shop. We rode in, parked our bikes and found the best looking gas stations this far on the tour. In the shop and restaurant section there was free wifi so we decided to have dinner there and discuss what to do next. As we sat there we felt very comfortable and wanted to stay on so we got back to our bikes and rolled over to the gas station part and were soon surrendered by the attendants. After a while of funny chat and jokes we played the trick we learned in Turkey which is asking if there is any camping site in town. The answer was immediately no, but one of the attendants pointed to the lawn between the gas station and the restaurant. Once again our resting place for the night would be at a gas station. 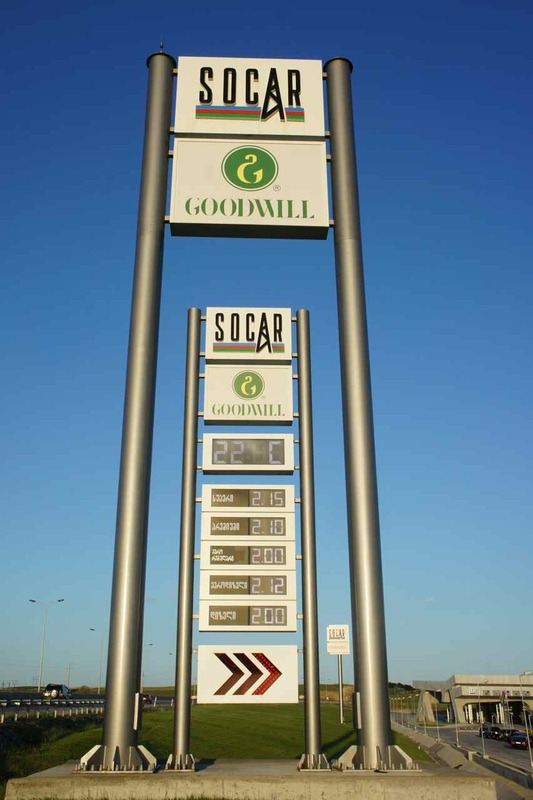 SOCAR is an abbreviation for State Oil Company of Azerbaijan Republic. Goodwill is a chain of modern grocery stores. We parked the bikes and took our bag with the computer and went back to the restaurant to google on knee injuries. After a good nights sleep at the gas station we went back to have breakfast in the restaurant. Wej’s knee still ached and we didn’t know what to do so I wrote an e-mail describing the situation to friends back home who are doctor and physiotherapists. They soon replied that it possibly was some internal bleeding in the knee and that the best thing was to rest. 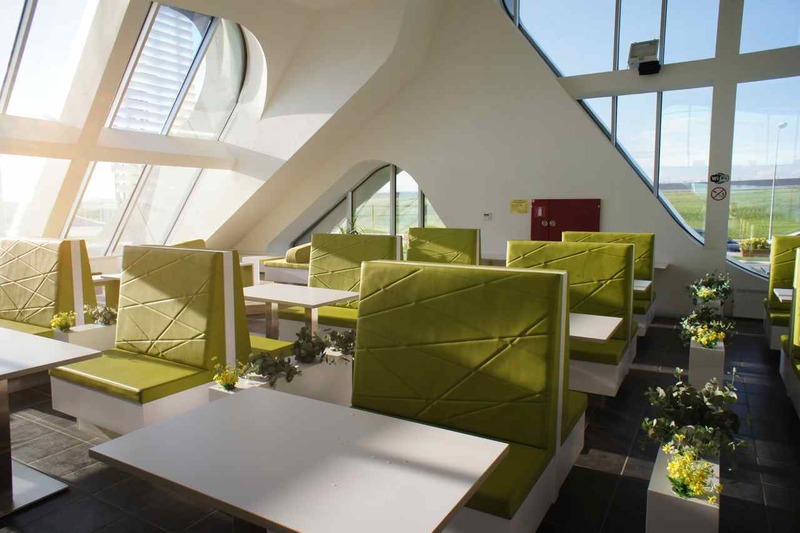 Interior of the restaurant at SOCAR. After spending the entire morning googling and writing e-mails it was time for lunch. Since we were already at a restaurant we didn’t need to go far. As we sat there eating, we saw another touring cyclist approaching the restaurant. He parked his bike and went in to order lunch and we moved over to his table to have a chat. The guy introduced himself as Simon from New Zealand and told us he was on an extended tour with his son, who had taken the train to Tbilisi. 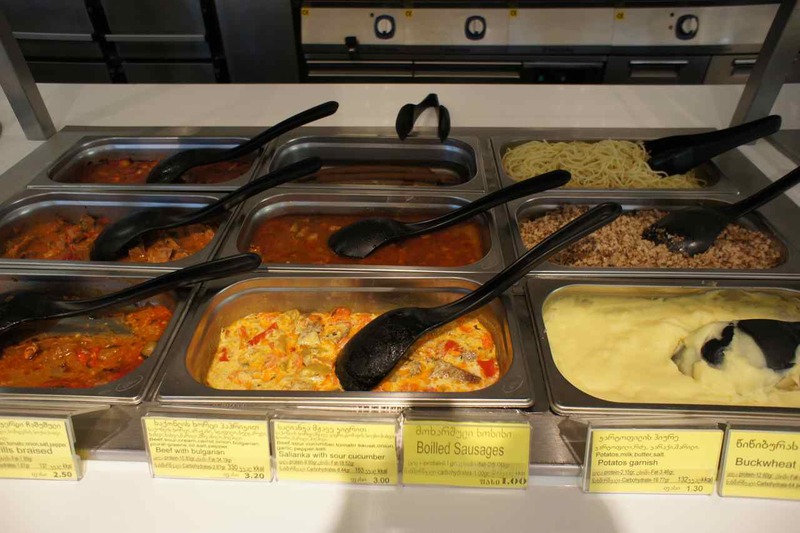 Food at the SOCAR restaurant. It looked a lot like some thai food. 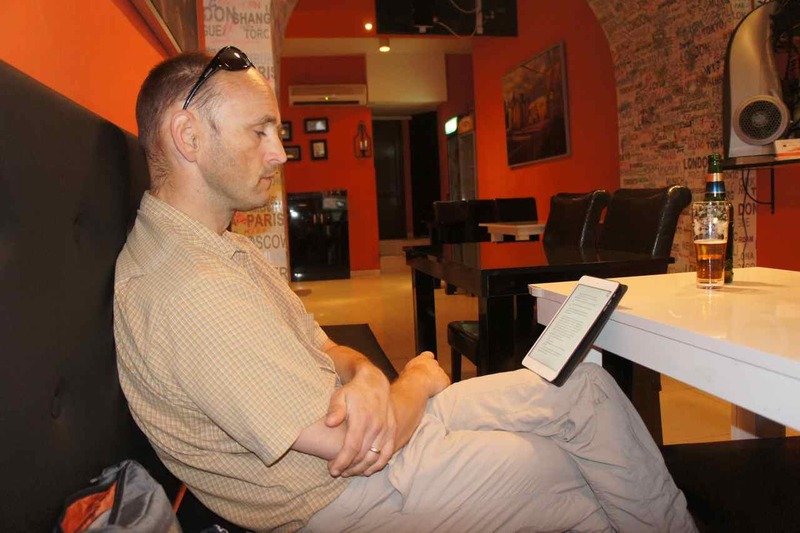 Most other cyclist we meet are a lot younger than us, but Simon is a few years older and told us he had taken a sabbatical year from work life to go cycling across the Euroasian continent – something that sounds very much like our own situation. 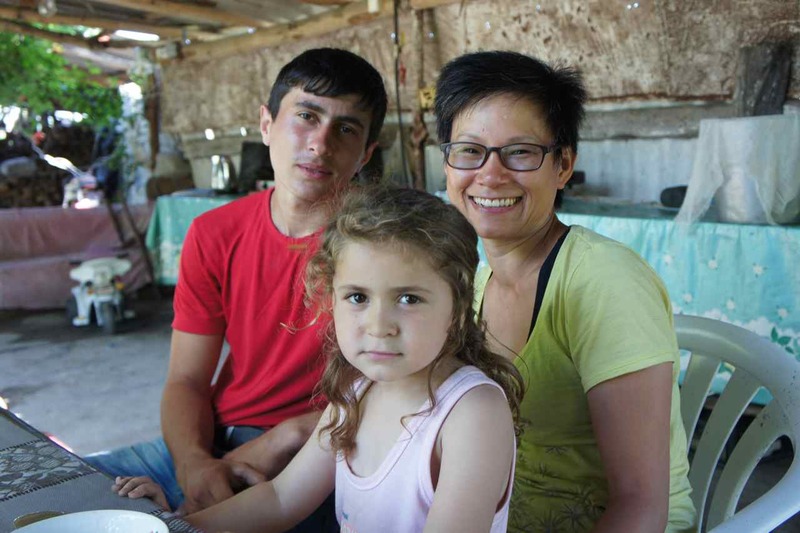 Simon had to rush to meet his son so we exchanged e-mail addresses and said we would try to meet in Tbilisi. As we saw Simon leave we had still not made any decision what to do. In the morning we saw Marko riding by, by lunch Simon came and left and we still hadn’t started to move. We had now traveled 4630 km from Sweden by our own muscle power but now we seemed to get stuck at a gas station just outside Stalin’s hometown. We still had 70 km to go on the nice highway to Tbilisi but Wej’s aching knee effectively put a stop to it and there was nothing else to do than limp into town and catch a train into Tbilisi. 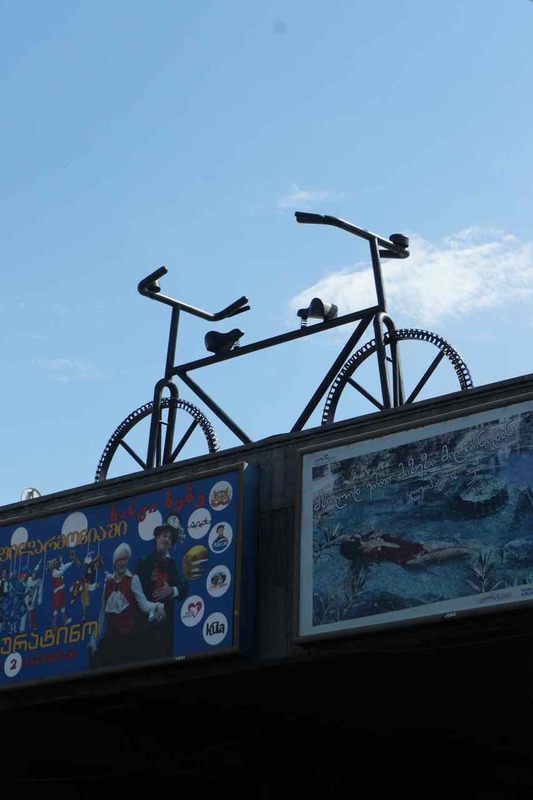 The purpose of this trip has always been to explore what is between Thailand and Sweden and who the people living there are, but the longer we have cycled, at least I have got more and more attracted to the concept of the unbroken wheel track all the way to Bangkok. 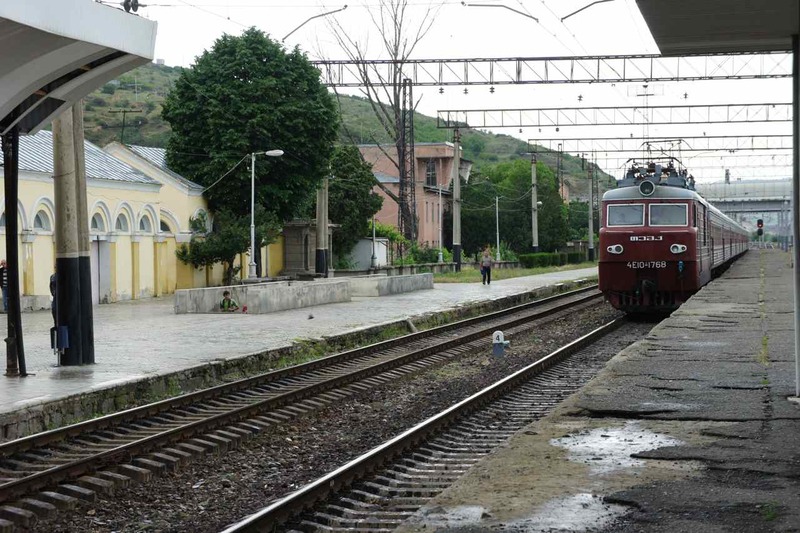 This seemed to be ruined now and while we have stayed in the guesthouse in Tbilisi the thought of getting on a train and go back to Gori to ride the 70 km here has struck me. 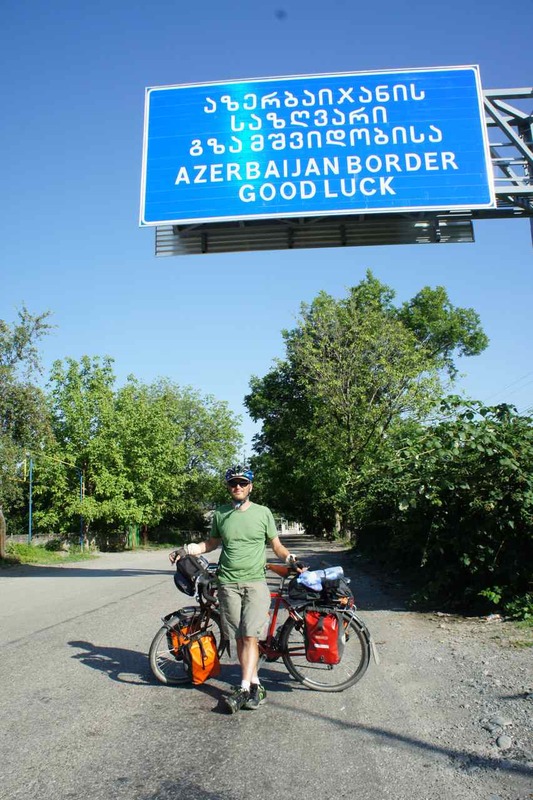 But then again, we do this trip together and it wouldn’t feel good in the end if I have cycled from Göteborg to Bangkok while Wej only has cycled that distance minus the 70 km between Tbilisi and Gori. In Tbilisi we checked in at the hostel which we knew Thom was staying at. Thom is one of the british cyclists we rode with for a few days in Turkey and it was a happy re-union when we knocked on the door to the hostel. Georgia is a wine producing country and in our hostel wine and coffee is for free. Thom and the two of us spent the evening drinking wine and sharing experiences and ideas in the hostel’s little lounge area. The following day we joined Thom and Nick to the Kazakh embassy to pick up their passports. Then the hunt for a decent bike shop started and we all ended up at Tbilisi’s Velodrome which definately has seen better days, but behind it there were some bike shops were skilled mechanics worked. On the floor in one of the shops we found an old and well used steel frame with the logo of ”USSR Race Team”. A retro bike built on that frame would definately be one of the coolest bikes ever to cruise the streets of western Europe. 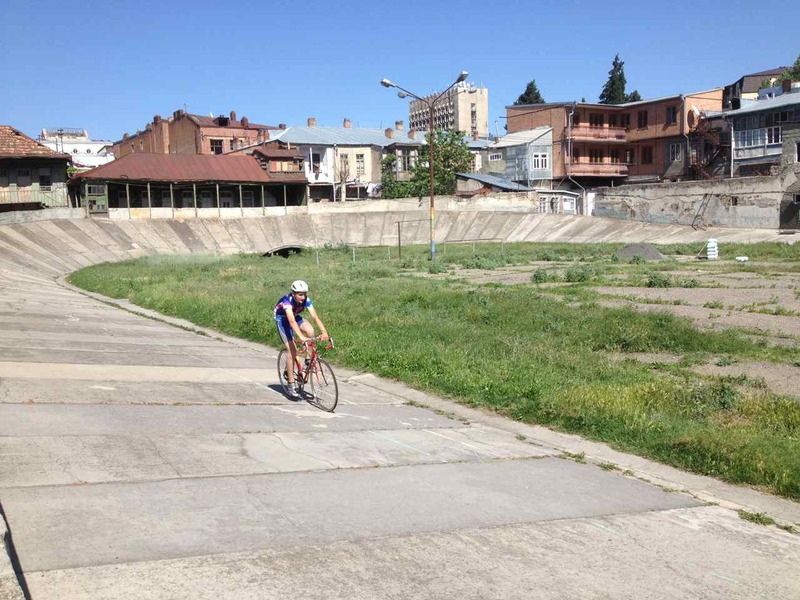 Tbilisi’s velodrom is old and in desperate need of repair. The next evening we called in all the cyclist we knew were in town and went to have a couple of beers at a bar. Since we are all going the same way and are having the same troubles getting visas and ferry ticket to cross the Caspian, the topics for the discussions were obvious. 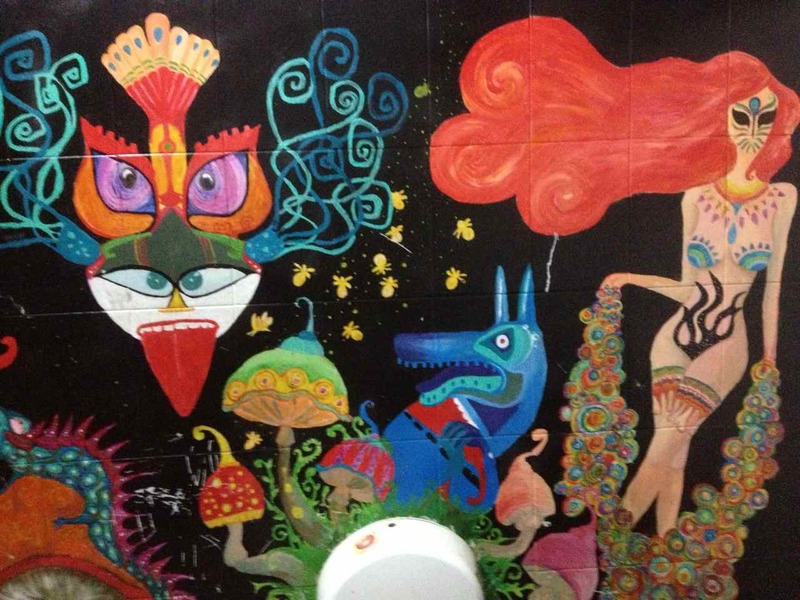 Fancy painted wall in the bathroom at the pub. This entry was posted in Posts in English on June 7, 2013 by admin.